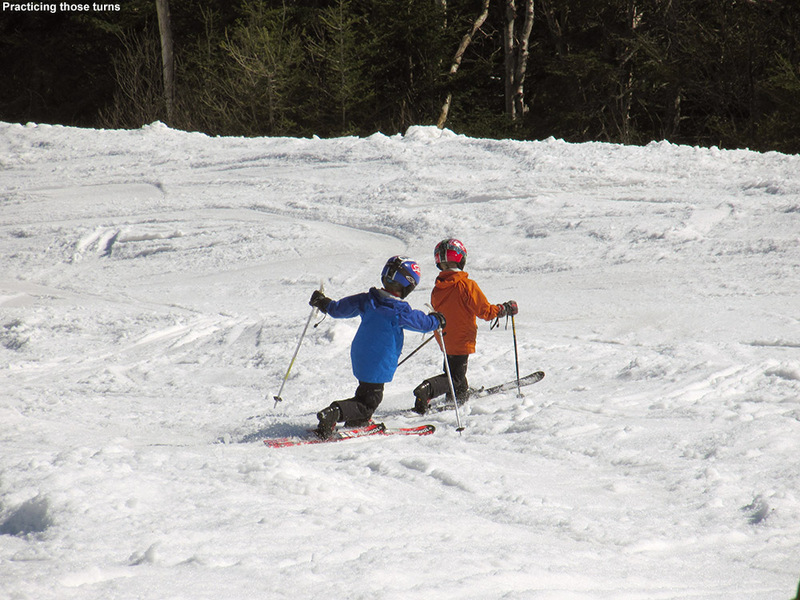 Morning clouds cleared away to provide sunshine for spring skiing today at Stowe. Temperatures have been fairly seasonable over the past week, with a couple rounds of light snow in the mountains to produce some small powder days on Monday and Friday. 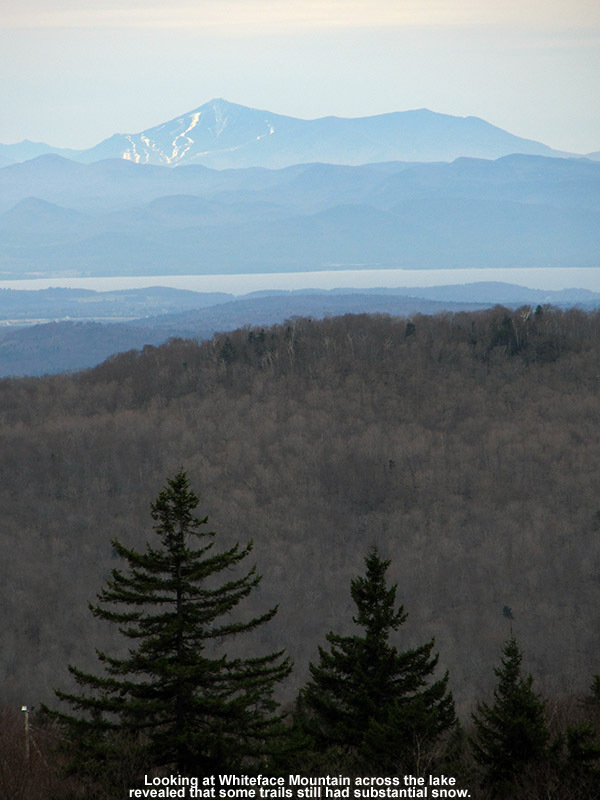 Today dawned sort of gray with a snowstorm passing to our south, but the clouds gradually dissipated, the temperatures rose to around 50 F at the house, and we decided to head off to Stowe for some afternoon runs. We’d been eyeing the forecast in the morning and it had seemed really iffy in terms of getting warm enough to soften the slopes, but eventually it became obvious that even the mountains were going to get there. En route to the resort we caught some views of Mt. 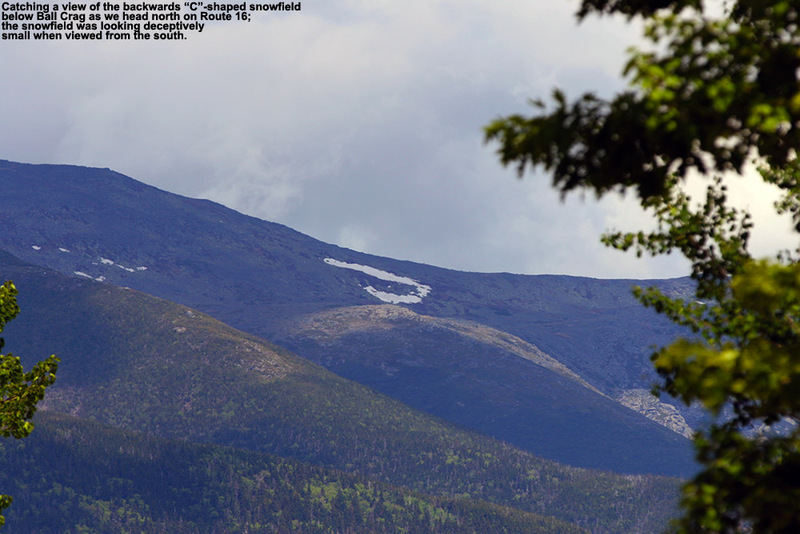 Mansfield, and you could still see the signs of yesterday’s snow in the alpine. Indeed, even in some shady spots down below 1,000’ in elevation, vestiges of the recent snow were still hanging around. We opted for the Mansfield Base Lodge again as we’d done last Sunday, but the parking lot was nothing like what we’d seen then; it was obvious that it was a Saturday and the weather was nice, because the main lot was packed. Temperatures were in the 40s F, and the sun was out, so folks were all around the mountain and parking lots having a good time. We worked with the boys on their Telemark Skiing using the same Ridge View/Sunrise/Tyro/Crossover combination that we’d skied last weekend. 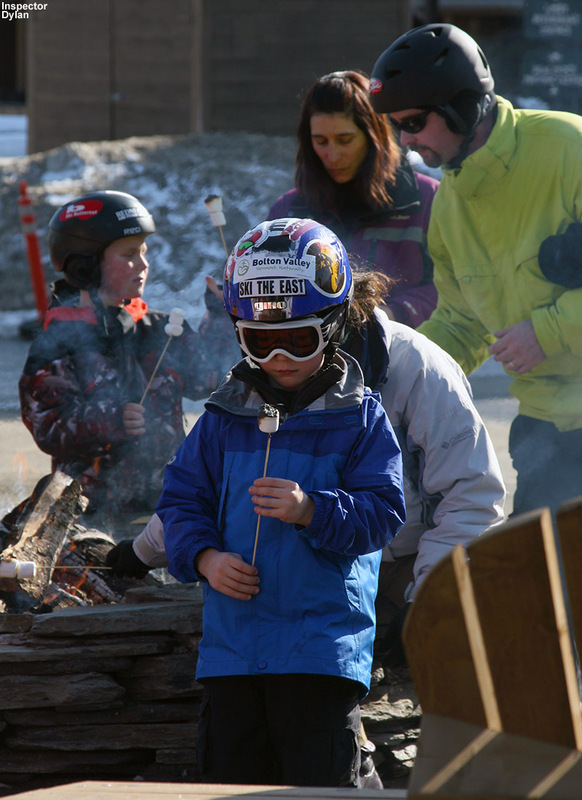 With the beautiful weather, the skier traffic was much higher today than what we’d encountered on Sunday, and that changed a couple of things. The terrain got a little more bumped up, which gave the boys some opportunities to try some Telemark turns through the moguls. Dialing in Telemark turns through the moguls requires quick footwork and good transitions, but the boys are at least getting to the stage in their progression that they can piece together some good segments. Dylan had a fall at one point that actually cracked his goggles a bit, so it looks like he’ll be able to get some fancy new ones like his brother. 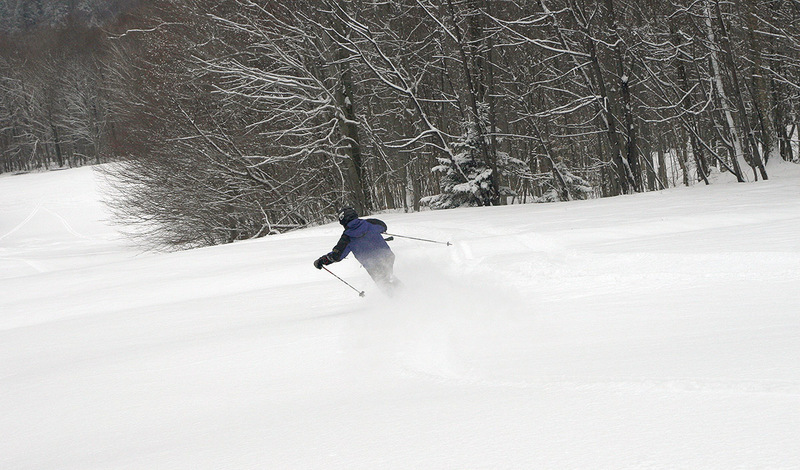 We even discovered that yesterday’s powder was around in areas off the edges of the trails. It had often thickened (and become good for building snowballs as we tested) but it was pretty nice in spots and it was refreshing to get a few floaty turns. 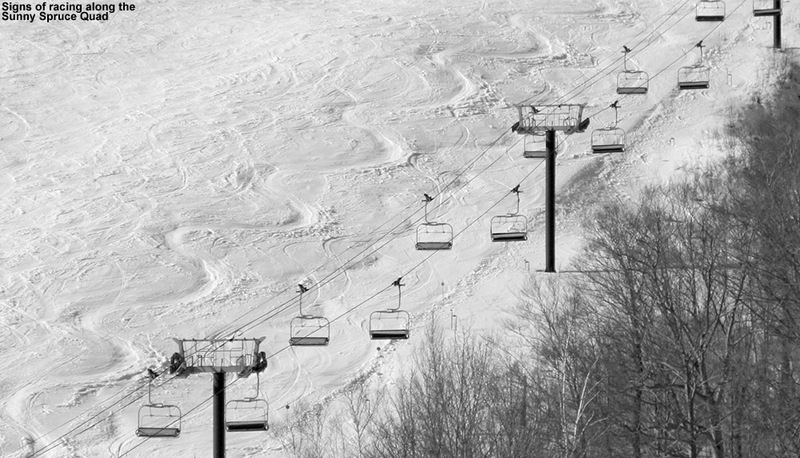 The downside of the nice weather was the increase in skier traffic to Stowe-like levels, which was unfortunately exacerbated by the reduced terrain options. Even sticking to the moderately-pitched routes, there were way too many people skiing way too fast for comfort. Ty and Dylan are definitely well into that intermediate stage with their Telemark turns, and while the terrain was perfect for them, the number of people straight-lining the slopes is really incompatible with kids trying to work on the larger radius turns that are common at their stage of learning. We had a few close calls, but fortunately no collisions. Eventually the Quad shut down for the day and we had to call it an afternoon. 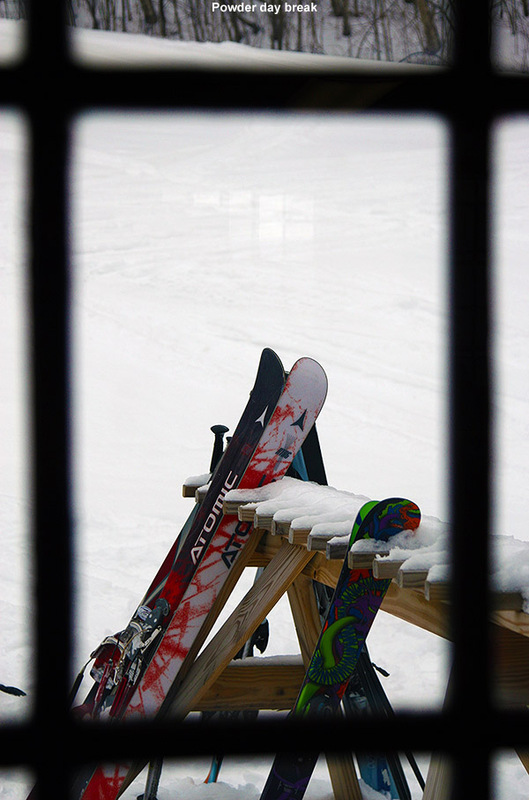 Back in the Mansfield Base Lodge we got to listen to the après ski band they had playing. It’s been kind of nice visiting the scene there; it’s really the old school alternative to the Spruce Camp Base Lodge. On the way home we checked in at some of the ski shops on the Mountain Road for a new pair of goggles for Dylan, and stopped for dinner at the Crop Bistro & Brewery, which is the new restaurant where The Shed used to be located. The caliber of the food appears to be a bump up from The Shed’s offerings, and not surprisingly, the prices have increased to match. As anyone who has been up the mountain road in the past several months has seen, the exterior of the building has been changed from the red of The Shed to a more yellowish color, and the interior has been all redesigned as well. They’ve gone with that “contemporary rustic” style, and have included several impressive (and large) photographs of the Vermont countryside from one of the local photographers. 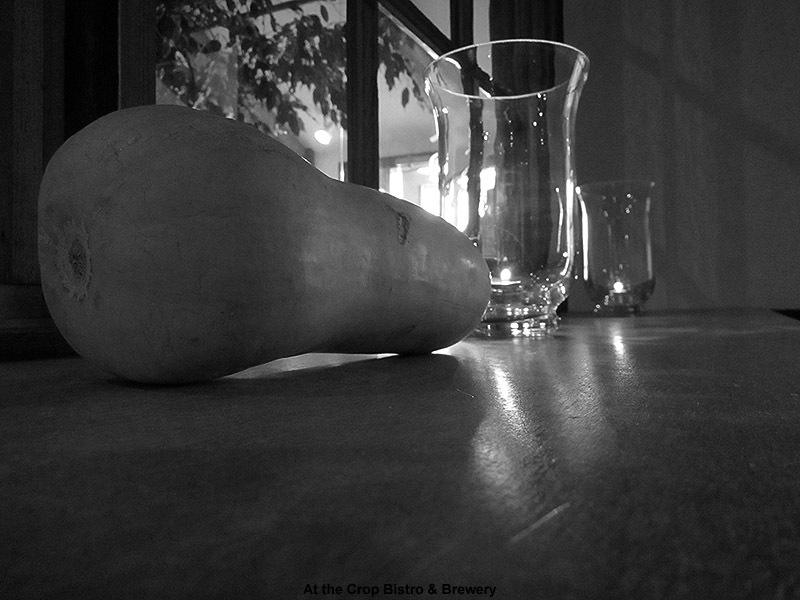 The overall feel of the Crop actually reminds me a lot of the Farmhouse Tap & Grill in Burlington, featuring high-quality food that is locally sourced as much as possible and really showcases what the local agriculture has to offer. I had an amazing pasta special with nuts, sun-dried tomatoes, mushrooms, and a spectacular sauce. 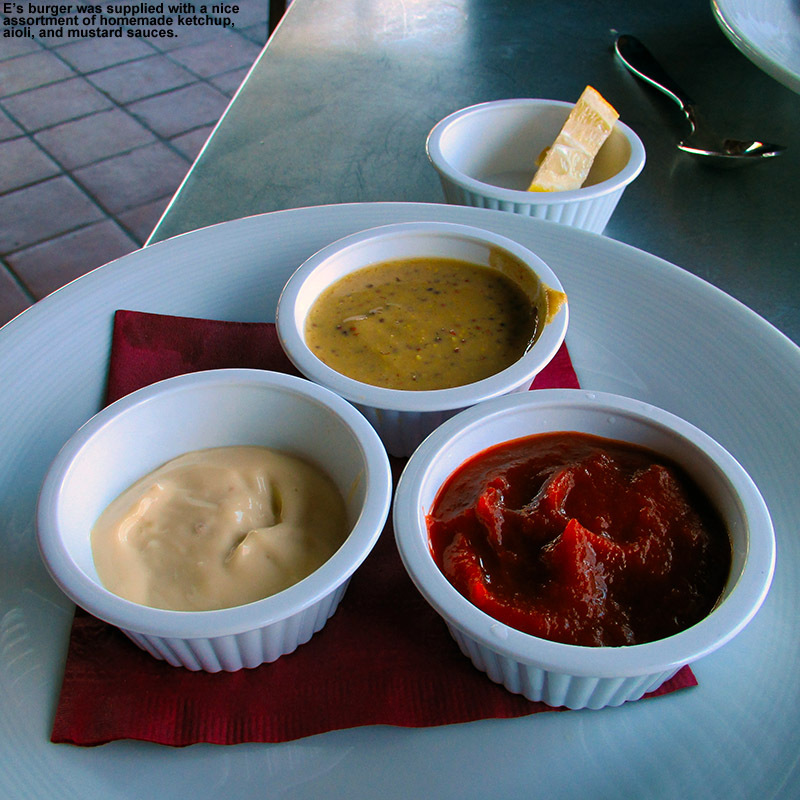 E had a cheeseburger, which was accompanied by some of their homemade sauces, and we all shared an appetizer of bread, honey, nuts, and an assortment of local Vermont cheeses. The boys got the grilled cheese, which was made with Cabot Cheddar. Price wise, the Crop doesn’t seem like it’s quite going to be the place that The Shed was for popping in for meals off the bike path, but the locavore approach is nice to see, and the food we had was really good, so it’s a nice addition to the dining options in Stowe. 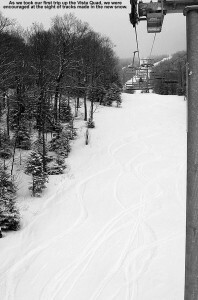 Stowe is planning to make tomorrow their last day running the lifts, and it seems to be mostly due to the lack of interest from skiers. There’s supposed to be some additional snow coming in later in the day tomorrow, but we’ll have to see what the clouds and potentially cooler temperatures do to the snow surfaces, and whether it’s worth heading out for the resort’s last lift-served day this season. 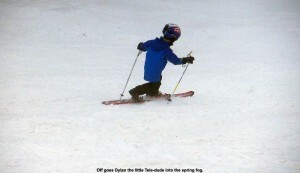 Dylan hits the spring snow today at Stowe for his third day in a row working on Telemark turns. 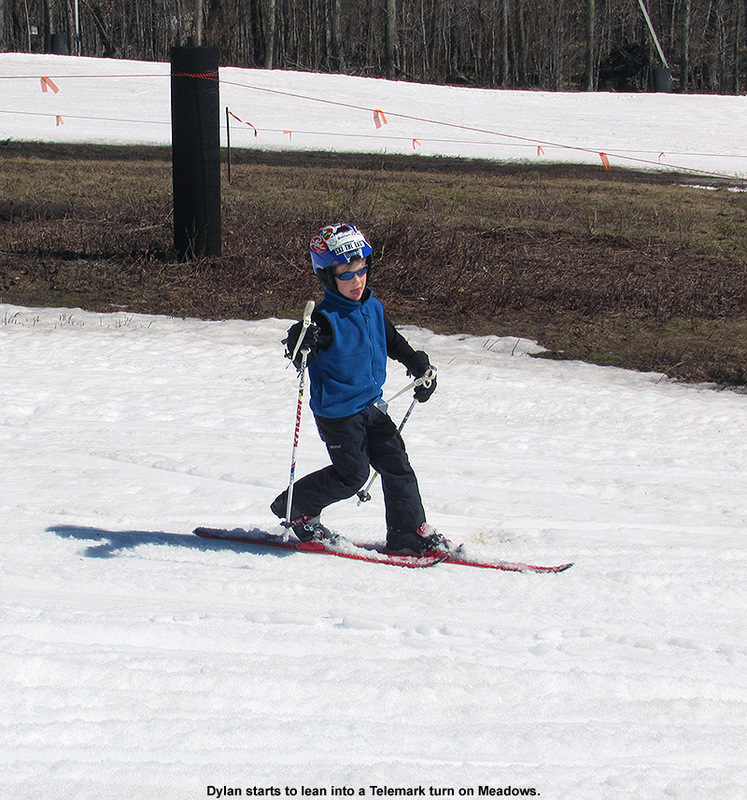 Yesterday, Bolton Valley finished up its lift-served season, and we were able to get out and make good use of the soft spring snow as the boys worked on their Telemark turns. 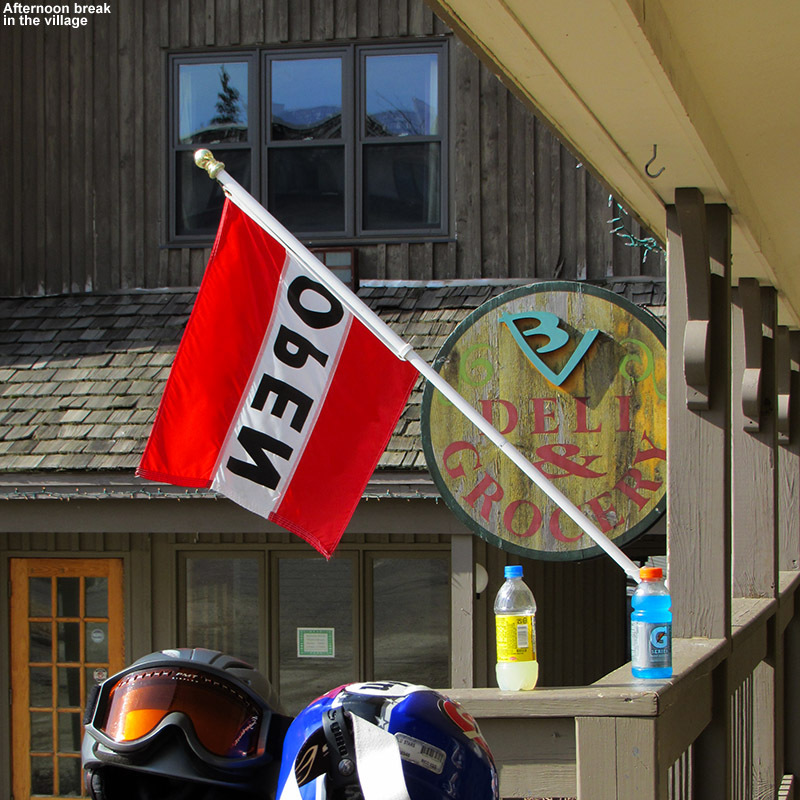 Weather conditions were fairly similar today, with temperatures around 40 F or so at the mountain elevations, so we were anticipating the chance for more spring snow on the slopes as we headed off to Stowe. On the way to the resort I was surprised to see a couple of pockets of natural snow all the way down at the elevation of the Matterhorn around 1,000’, but in general one had to head up above 2,500-3,000’ to really get into substantial natural snow. The snow at the Mt. 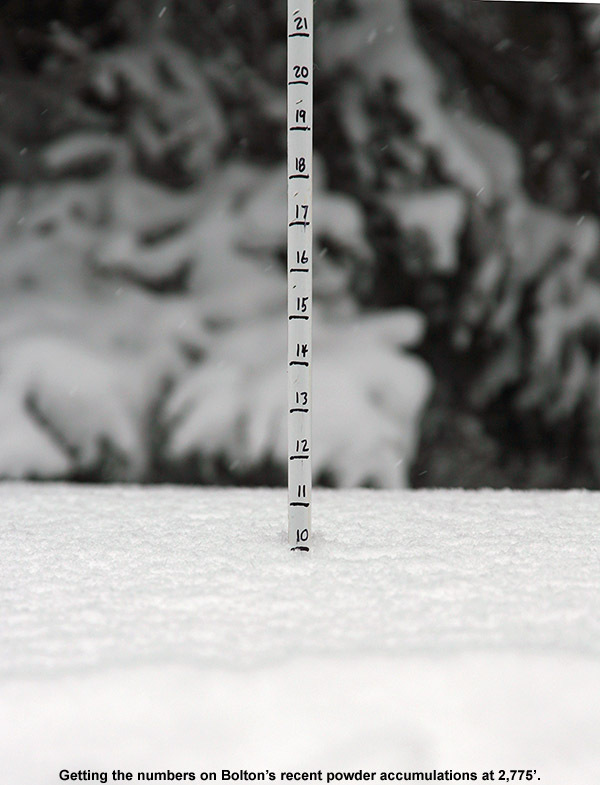 Mansfield Stake is down to just 26 inches after being at over 80 inches near the beginning of the Month – and this is at a time when the snowpack on Mt. Mansfield should still be increasing. Based on the forecast, it looks like the melting will cease for a while, and there could even be some increases with additional snowfall, so this may mark the end of the most precipitous melting. 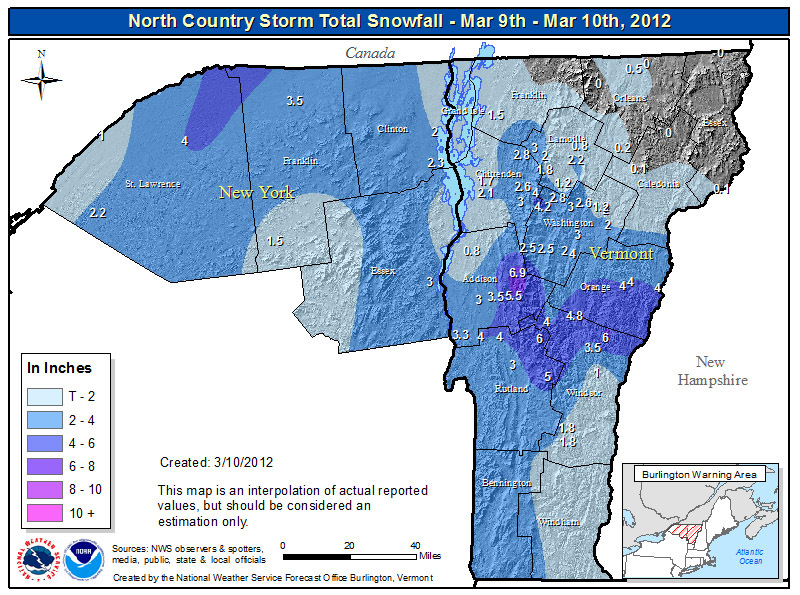 The rapid jump in snowpack in February combined with the quick drop in March makes for quite a dramatic plot of the Mt. 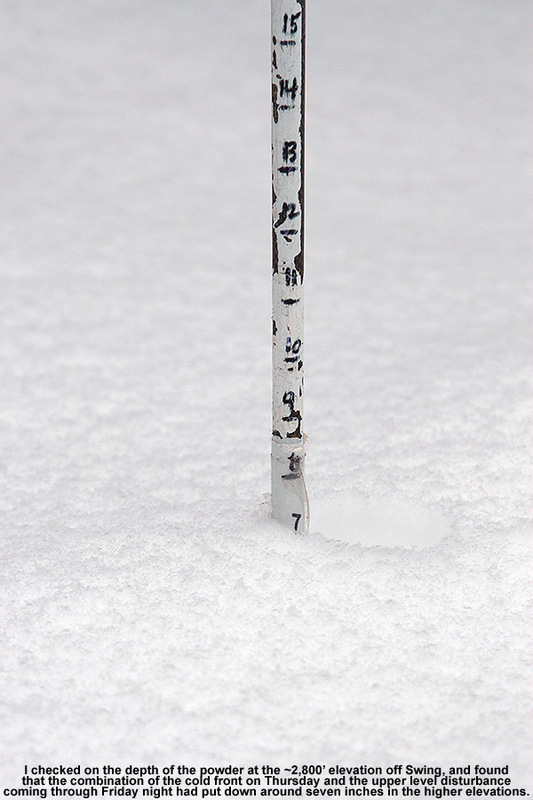 Mansfield snow depth. The plot of snow depth at the Mt. 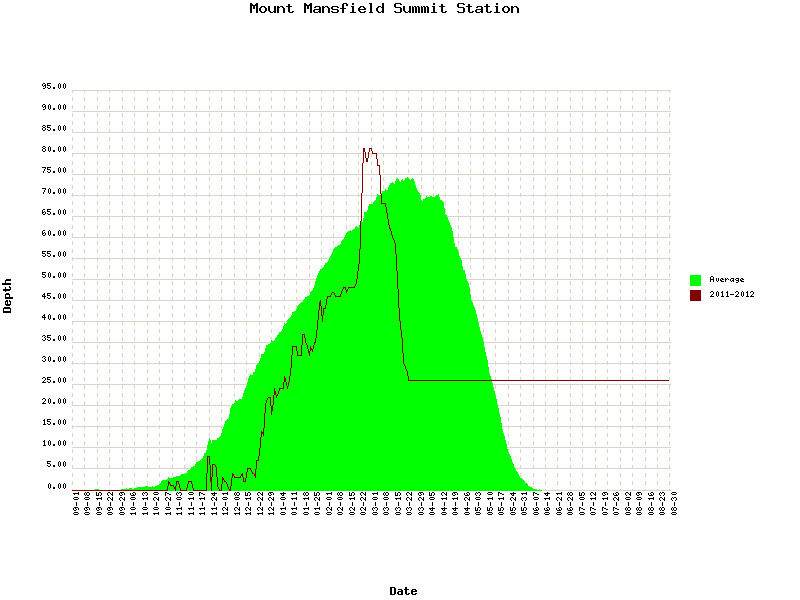 Mansfield stake this season as of today - the past month has seen a dramatic rise and fall in mountain snowpack. With the gray skies today, we weren’t surprised to see that parking lots were minimally occupied. For a change of pace from the rest of the season, we decided to park on the Mt. Mansfield side of the resort, and we were able to get a convenient spot right in front of the Mansfield Base Lodge. It was fun stopping in there and checking out the scene, since we’ve been over at the Spruce Camp Base Lodge all season. 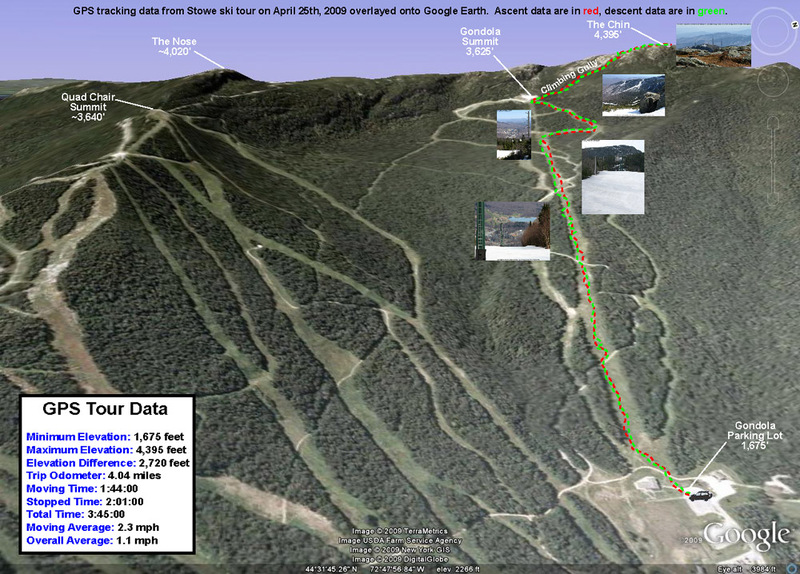 Stowe has currently got the most available terrain in the state thanks to their snowfall and snowmaking, and when I checked on the trail report on their website, I saw that there would be plenty of low/moderate angle terrain that would suit the boys as they worked on their Telemark turns. This painting iin the Octagon caugt our eye, especially with the theme of the day. Much of the mountain was shrouded in fog, but the snow was nice and soft right from when we arrived around midday. The route that we used was Ridge View to Sunrise to Tyro to Crossover to Dalton/Liftline, and it was a perfect mix of pitches for the boys. Both Ty and Dylan had obvious “vanilla” (in this case turning to the right) and “chocolate” (turning to the left) sides today, so we worked on catching that chocolate side up to the vanilla. We noted that on their bad side, the boys would often have their weight a bit too far back, so we were able to pass that along to them and they were able to use it to consciously work on fixing those turns. With this being their third day in a row on their Telemark skis though, their improved comfort level and increased skills were very apparent, and they were having a lot of fun with their turns. 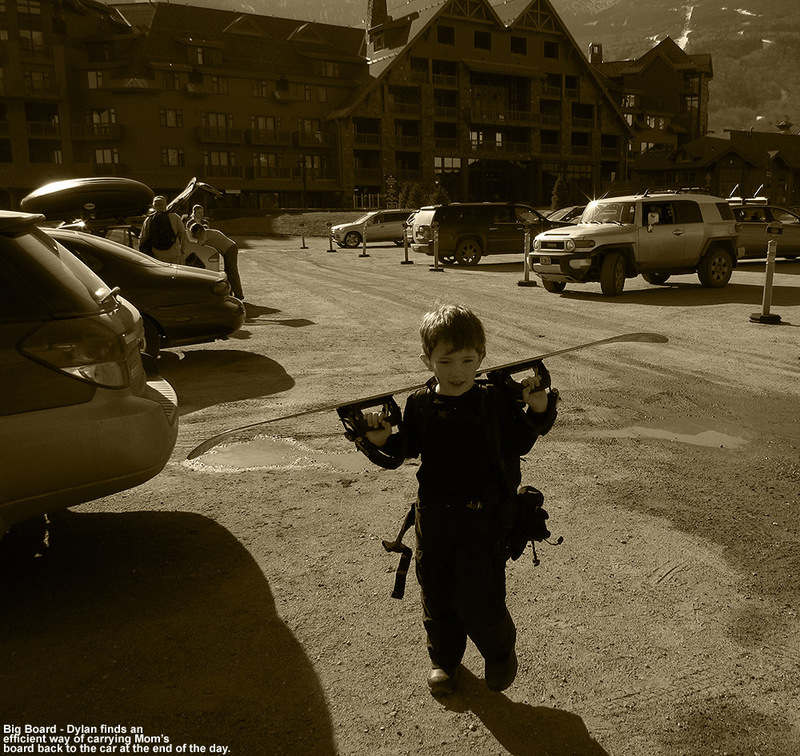 E commented on how they were quite disciplined and rarely ever needed to resort to alpine turns, and she was especially impressed when she’d find herself in tight quarters throwing in an alpine turn and find that the boys were still dropping the knee. The boys were certainly feeling those long Stowe runs in their legs, so we took a break up in the Octagon before it closed; it was mellow scene with just a few people around. 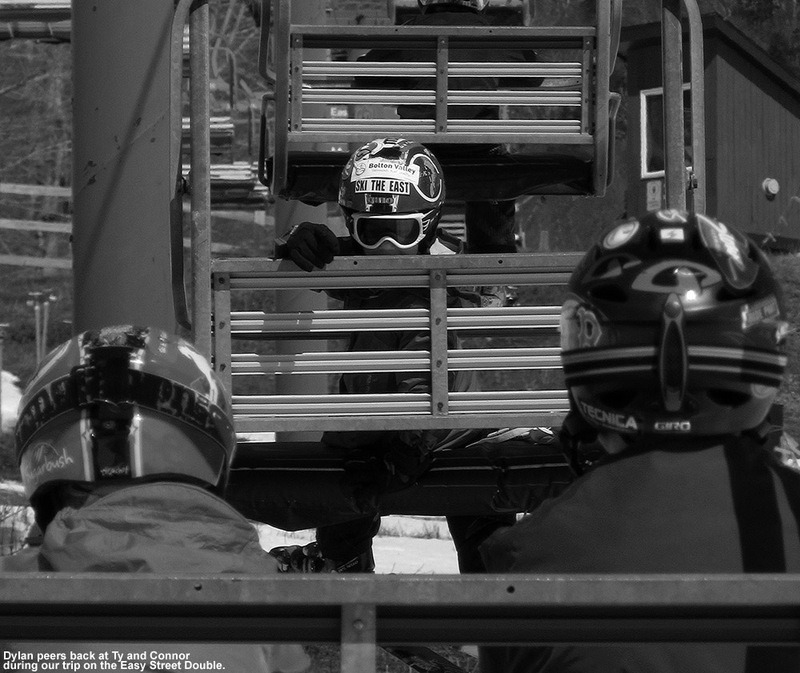 Four riders prepare for another round of jumps as they climb their way back up in Stowe's lower terrain park today. On one of our runs we stopped and watched what appeared to be an impromptu session taking place in the lower terrain park near the Mountain Triple Chair. They had a tent set up with an announcer on a loudspeaker and music, and he was calling out the tricks that the athletes were throwing down. 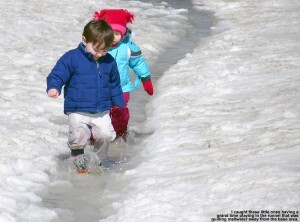 It seemed like they were having a lot of fun making good use of the soft spring snow. The weather is really supposed to cool off for the next couple of days, with a chance for a little snow tonight and mountain temperatures in the single digits tomorrow night. I think we got lucky with the soft snow surfaces this weekend, but there definitely won’t be softening with high temperatures only in the 20s F tomorrow. The snowpack is certainly going to be preserved this week though, and perhaps we could even see some increases depending on how much snow falls, so that will help keep the ski season going as we head into spring. Ty dialing in some Telemark turns today at Bolton Valley - although terrain options were limited due to the recent warm weather, the snow on Sherman's Pass was quite nice today. Record warmth occupied the region over the past week, with temperatures that topped out in the 70s and 80s F, forcing the closure of many trails at the local ski areas. Fortunately, Bolton was able to keep things rolling by managing their available snow, and they were open for skiing today. Although the warmth of the past couple of weeks has meant a lack of powder, altering terrain choices from the trees to more on piste alternatives, it’s been a boon for Ty and Dylan’s Telemark skiing. They worked hard on their turns last Saturday at Bolton, E brought them to Stowe yesterday where they worked some more, and the plan was for them to keep at it again today. They don’t often get back to back days of Telemark skiing, so we were excited to get out there today to really put in a reinforcing shot in their progression. After the warmth of the week, temperatures cooled and clouds came in today, so we were concerned about the snow surfaces stiffening up. 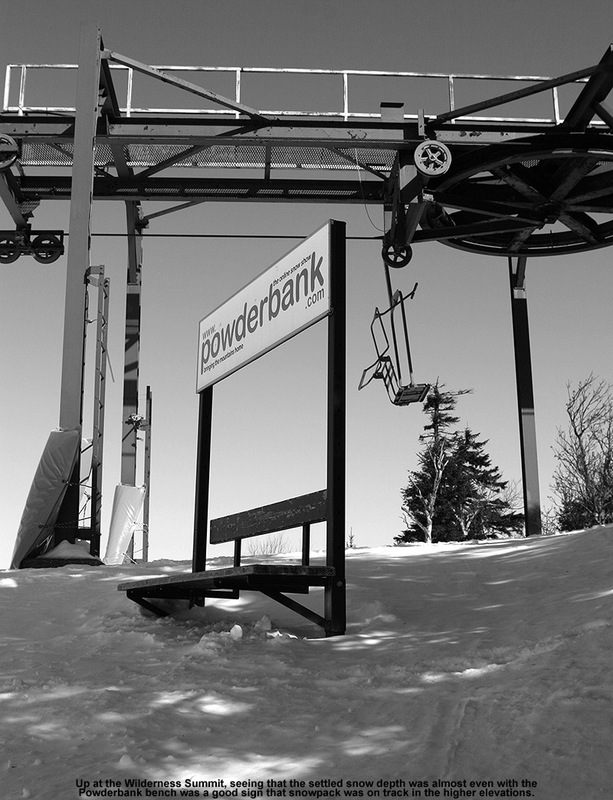 When Powderfreak mentioned that the mountain temperatures were cool enough to firm up the snow at Stowe, it didn’t instill a lot of optimism, but we decided to head up to Bolton anyway and check things out. 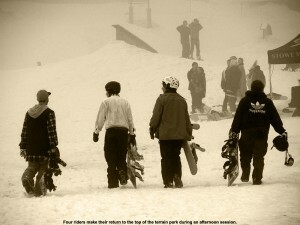 We got up to the Village around 10:00 A.M. for the opening of the Vista Quad, and the temperature was 41 F at the base. Plenty of parking was available in the top tier lot because so few skiers had come out, and the base area was pretty quiet aside from a large group of what looked like kids and ski instructors. 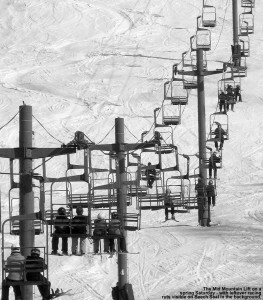 It didn’t appear as though they were going to ski; it just seemed like they were going to have some sort of end of the season gathering. 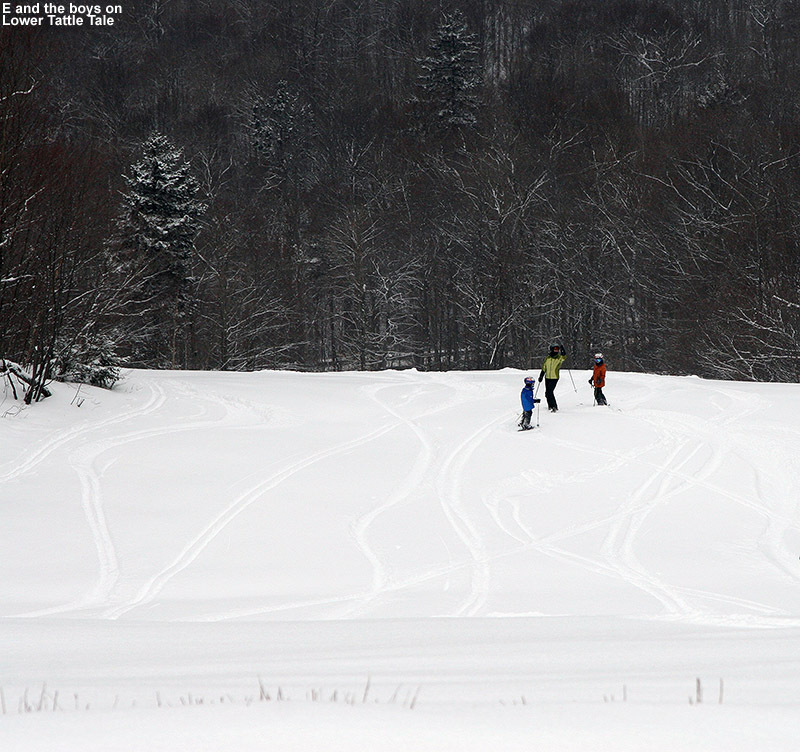 After an initial gathering of what looked like kids and ski instructors, the main base area at Bolton Valley was very quiet today. 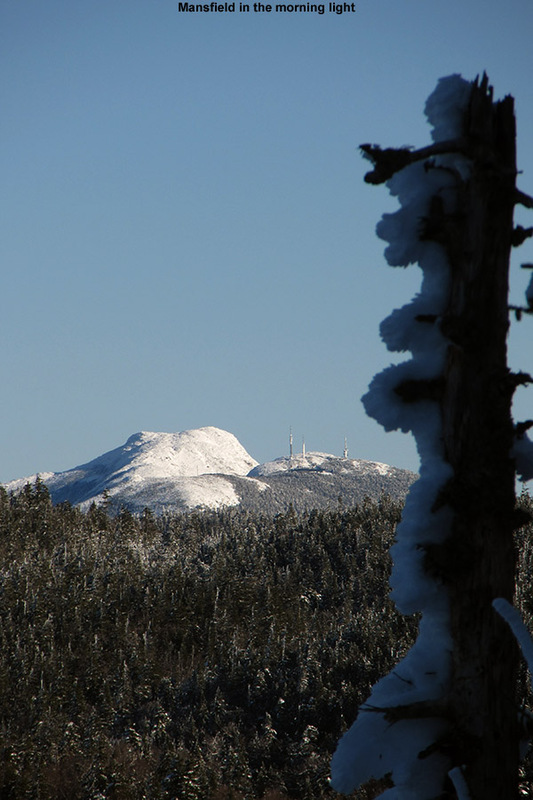 The elevation at which natural snow begins to appear has risen quite high, and we didn’t see any until around 2,000’. Even above that though, it remained very patchy all the way up to the Vista Summit above 3,000’. With such intense heat over the past week, it was a different melting pattern than what I’m used to seeing on the mountain. 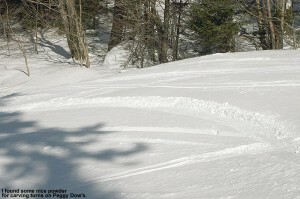 Options for skiing were the Spillway and Sherman’s Pass routes up top, which combined into Beech Seal on the lower mountain. 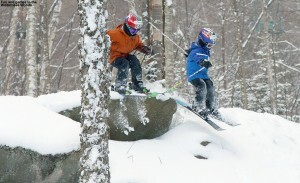 Sherman’s was the plan for the boys on their Teles, and the snow turned out to have an excellent consistency. 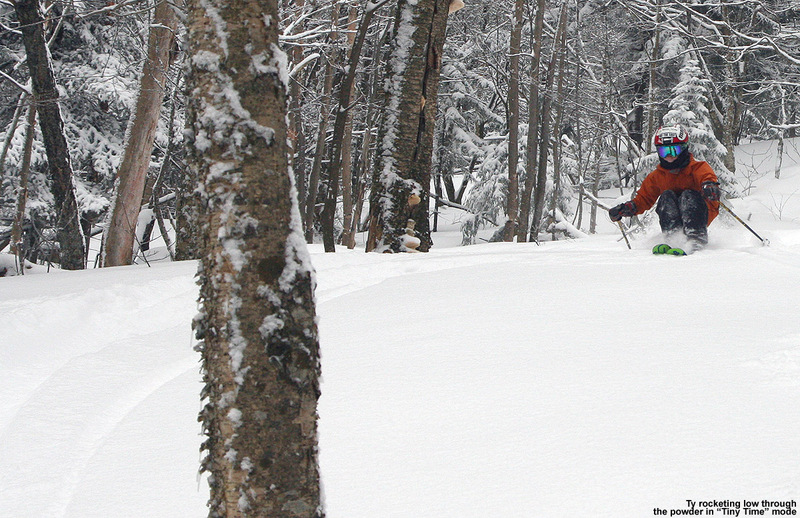 Thanks to grooming and/or skier traffic, it had softened to great corn snow. The snow actually turned out to be even better than what we had last Saturday, which was a little on the soft side and pushed the boys around in spots during their turns. In areas without the skier traffic or grooming though, today’s snow was a bit firm, so there’s clearly plenty of thermal mass left in the snowpack to keep it cool. We had wondered what it was going to be like in terms of crowding today with just a couple of routes open, but there were so few people skiing that it wasn’t an issue – E and I estimate that we saw about 30 to 40 people out there on the slopes, and that includes quite a few ski patrollers. 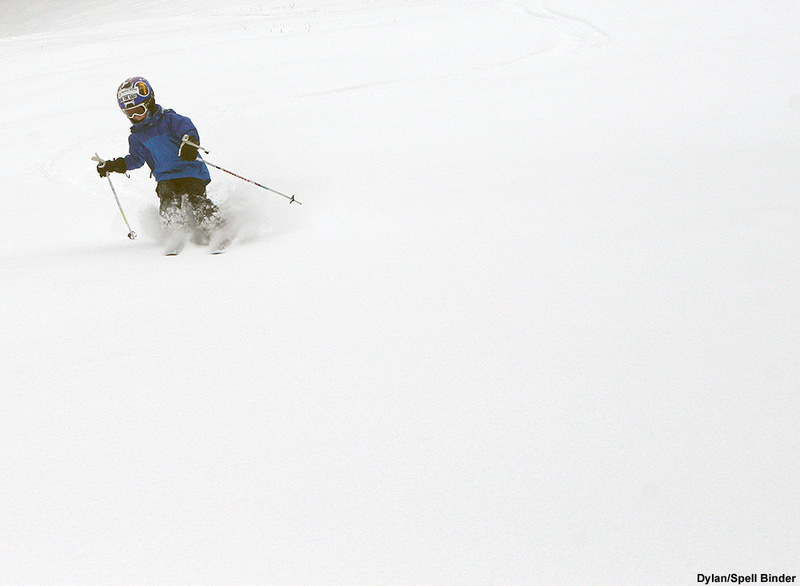 Sherman's Pass offered up some great spring snow today to let both boys arc through plenty of nice Telemark turns. Since E skied with the boys at Stowe yesterday, she got to watch the progression in their Telemark turns, but this morning was the first time I’d seen them in action since last weekend. I quickly got to witness the improvement that the additional session and back-to-back days had made. 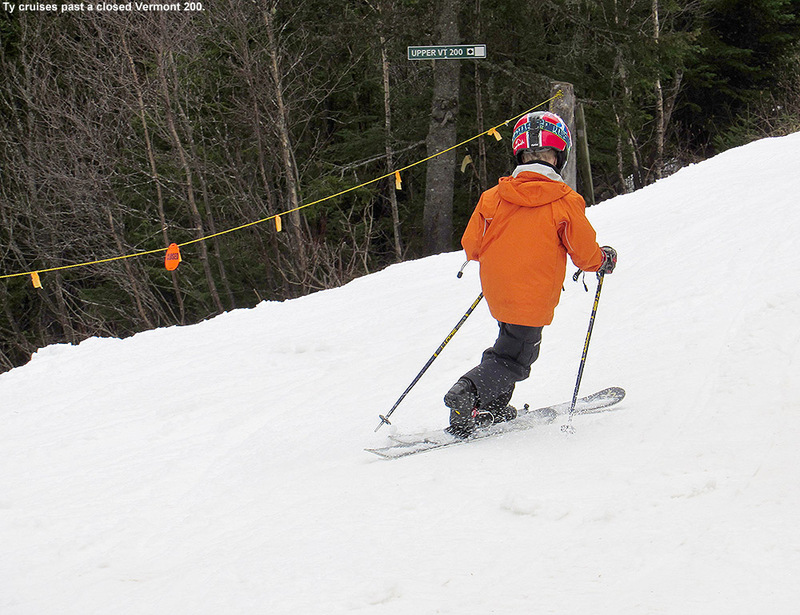 Both boys were holding stronger Telemark turns on steeper pitches. Dylan still has an obvious “vanilla” side (and I guess therefore a “chocolate” side), but Ty seemed to be pretty consistent to the right and left. We therefore had him working on transitions between turns, because we could see that that was an area of weakness. 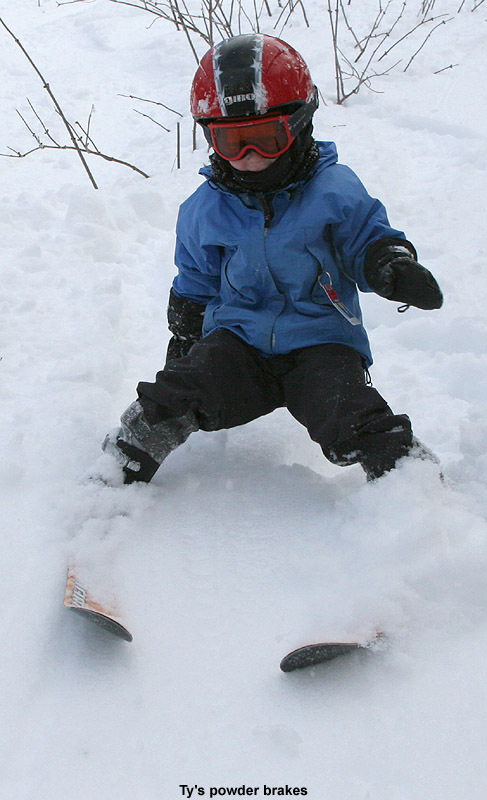 Right now he’s completing many good turns, but not flowing into the next one, and E and I can both recall from our learning that dialing in that transition represents a big leap in one’s ability to link smooth, quick Telemark turns on various pitches. 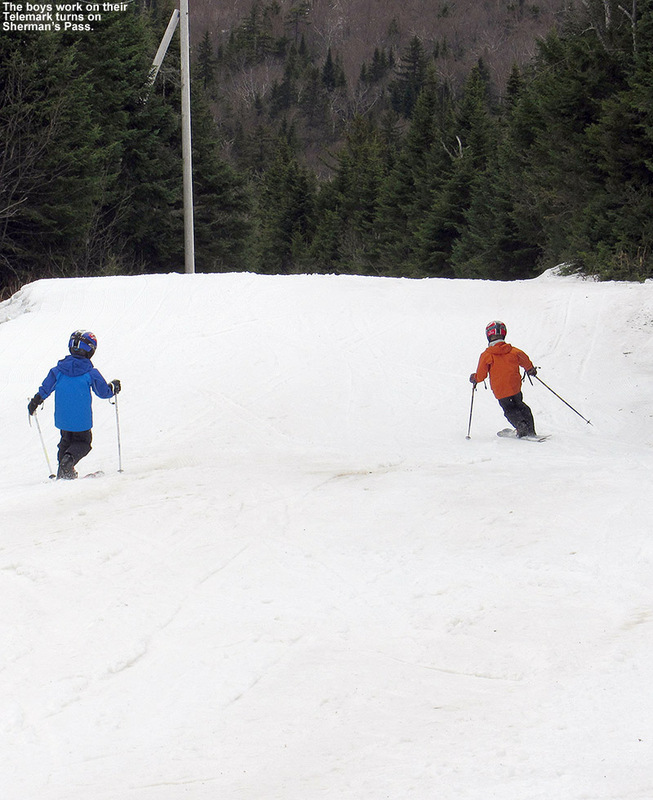 In any event, both boys really put out a lot of great turns, and since Bear Run was closed, they were nailing them on the steeper top section of Beech Seal. Both boys were holding long Telemark stances even in the flats to work on their balance, and Dylan commented on how it was really working his legs. 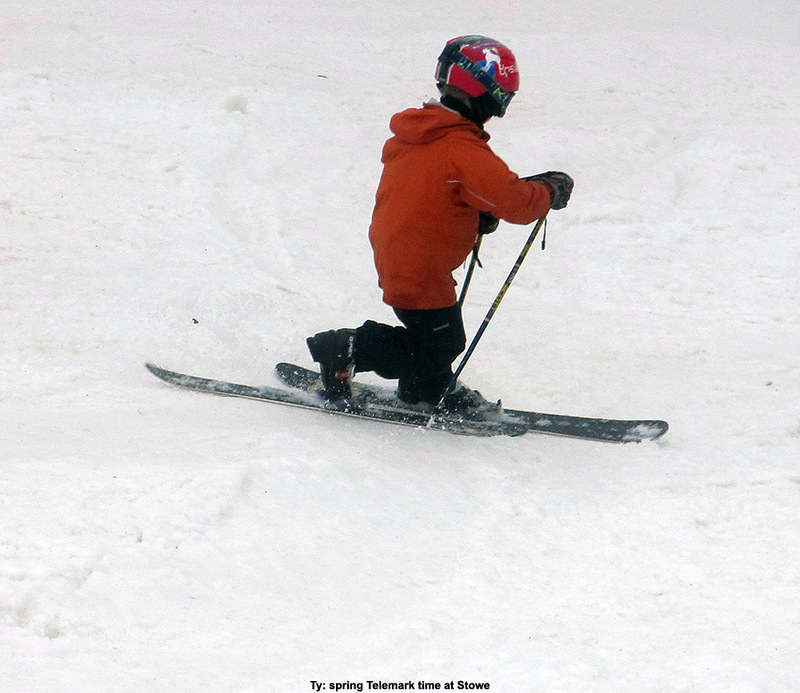 Telemark skiing will do that… apparently even to a six year old. The snow was definitely good enough for some additional runs, especially with the way the snow surfaces and terrain were working out well for the boys, but we finished up early because we had to be home by noon. We were meeting my mom to head off to my cousins sugarhouse in Barton for his annual get together. It’s interesting that Bolton was only planning to stay open until 2:00 P.M. though, and they are making this their last day. With the cooler forecast and potential for more snow in the coming weeks, there’s no question that they could stay open if they wanted to, but I’m sure it’s a financial decision with so few people skiing. 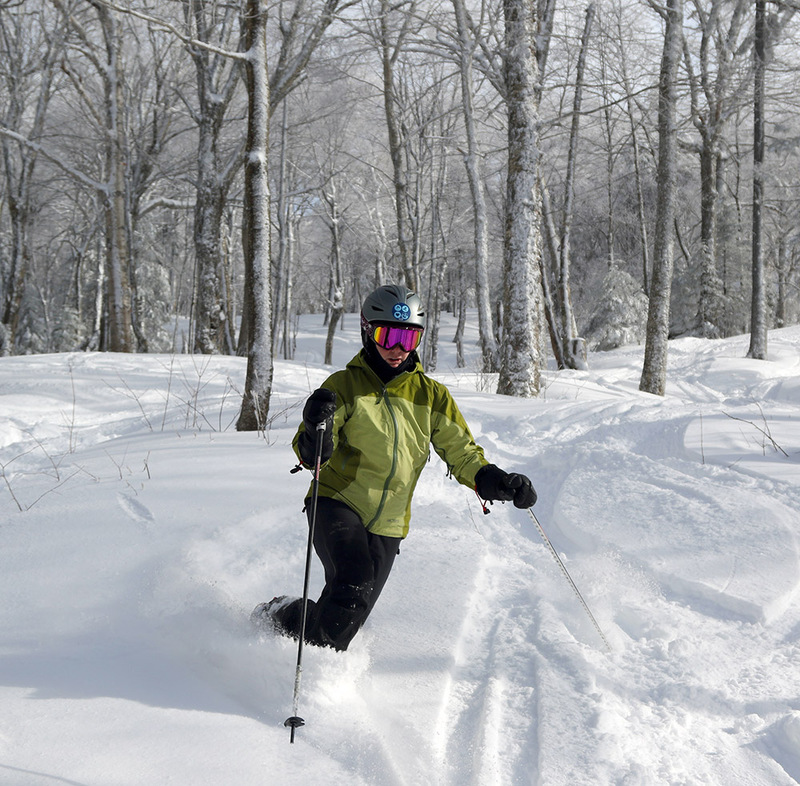 The warmth of the past week no doubt shifted many people’s thoughts away from skiing, and folks aren’t going to be too interested in paying for a lot of days on limited terrain. Bolton’s normal closing is next weekend anyway, and with the extra weekend that they stayed open last season due to the prodigious spring snowpack, closing a week early this season basically averages things out. It is great that there is still plenty of base down for earned turns in the coming week if we get more powder, or even if the weather warms up for more corn snow. This is actually a second hand report from Stowe today – E didn’t have any parent-teacher conferences scheduled and decided to take the boys out alone for some Telemark skiing in the warm spring weather. Temperatures have been incredibly warm as of late, with Burlington reaching a record 76 F on Sunday, which is 35 degrees above the average high temperature for March 18th. However, that impressive record temperature was only the beginning; it was quickly bested on Monday, by a high temperature of 79 F, and then again on Tuesday with 80 F, and finally on Wednesday and Thursday, to the tune of 81 F, which is roughly 40 degrees above average. The record temperatures finally waned today, but it was still quite warm, and the damage to the snowpack has been done. The snowpack at the Mt. 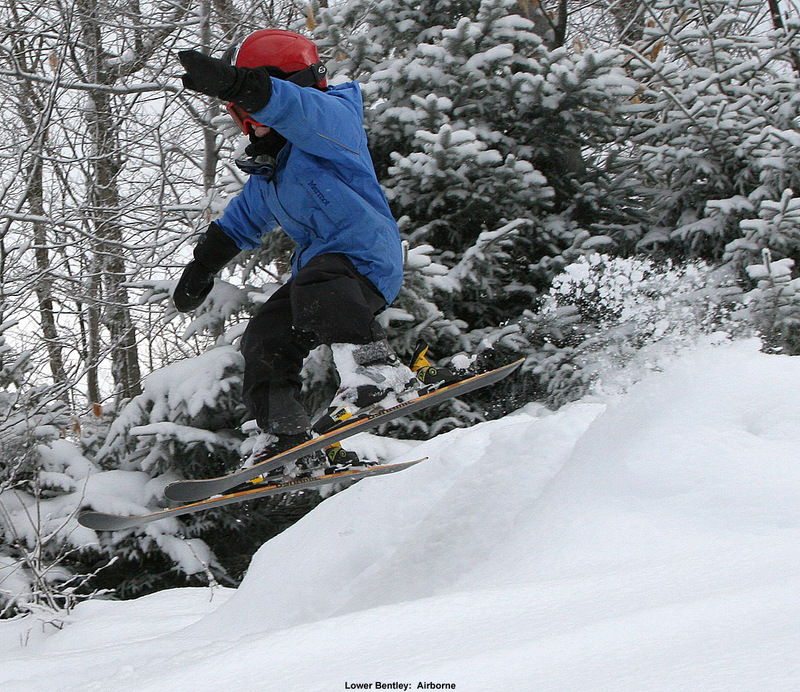 Mansfield Stake dropped 30 inches during the period, and in the lower elevations, slopes were melting out everywhere. To couple such an historic period of warmth with a winter season that has already been quite warm and low on snowfall, really begins to put this season in rare company. Were it not for the big storm that hit the area at the end of last month, I shudder to think where we’d be in terms of snowpack. 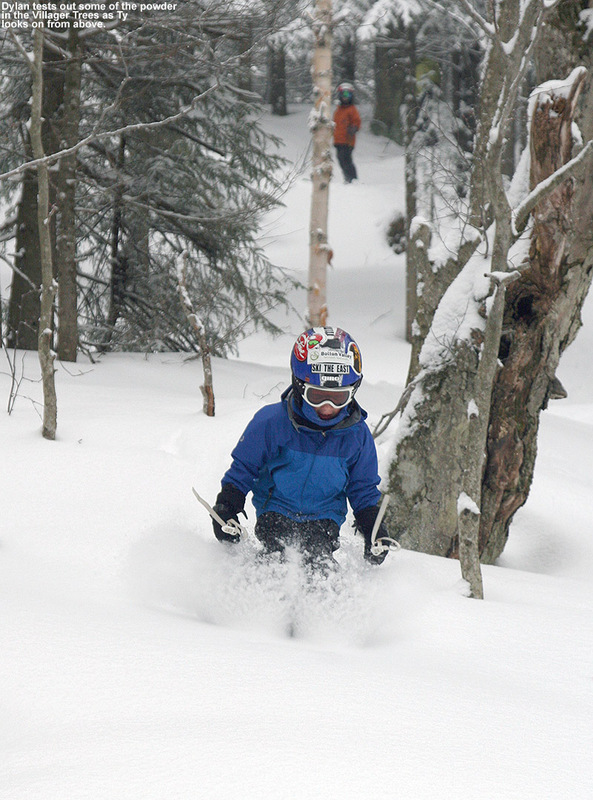 But, the good news is that local skiing continues to roll along, and since the resorts have been able to make it through this almost perfect storm of insults to the snowpack, it means that they should be able to handle just about anything that the weather can dish out. 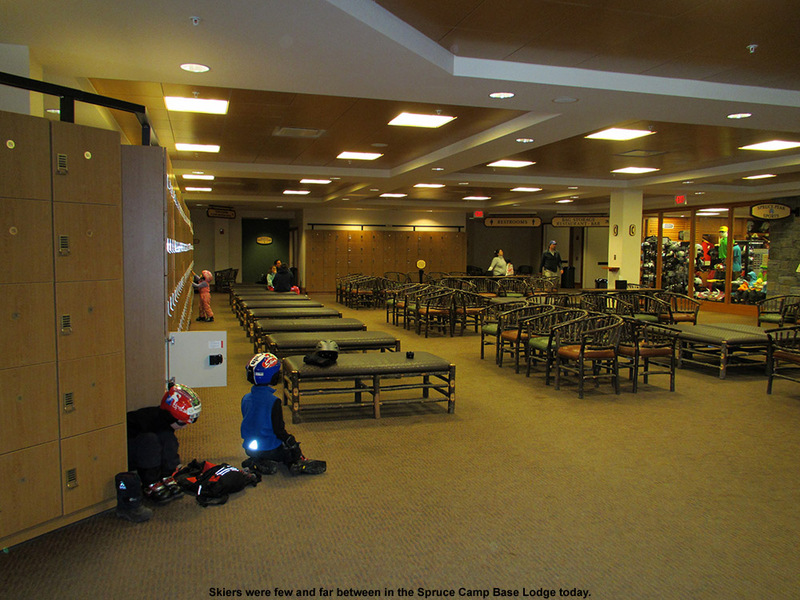 E said that the Spruce Camp Base Lodge was utterly deserted today, and showed me her picture of just how empty is was in the locker area on the bottom floor. Not surprisingly, they ran into friends in the form of Mrs. Cabot, Eliza, Ben, and Izzy at the base of the Spruce Peak chairs. E and the boys did a couple of runs off the Alpine Double, and Ben hung with them as he continued to learn how to snowboard. 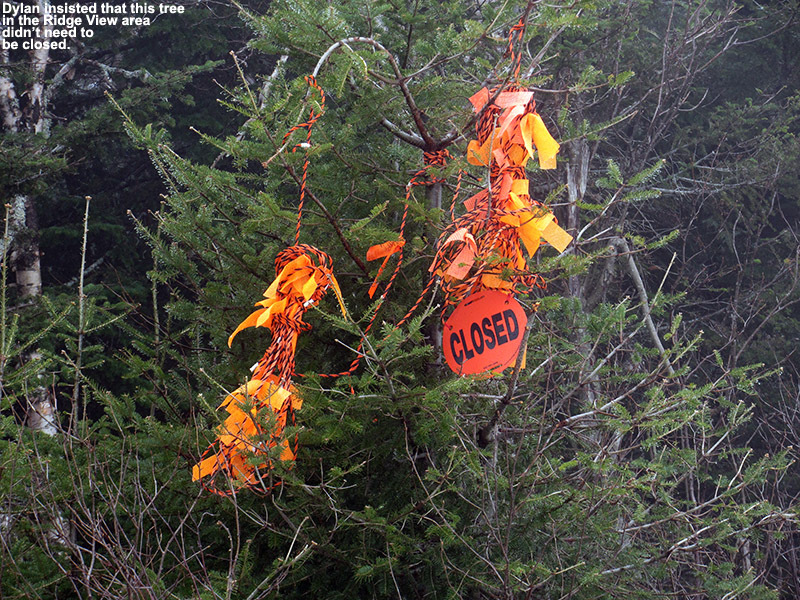 Some areas, such as the alpine slide tunnel, were closed due to melting, and connecting over from the top of the Alpine Double to the Sunny Spruce side involved a lot of traversing across grass. 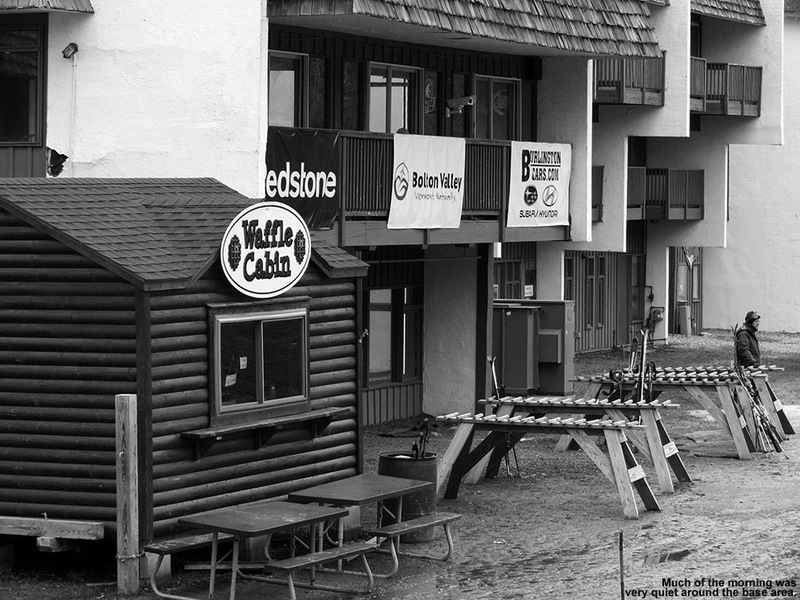 They did have Slalom Hill open with good snow, and race preparations could be seen taking place. 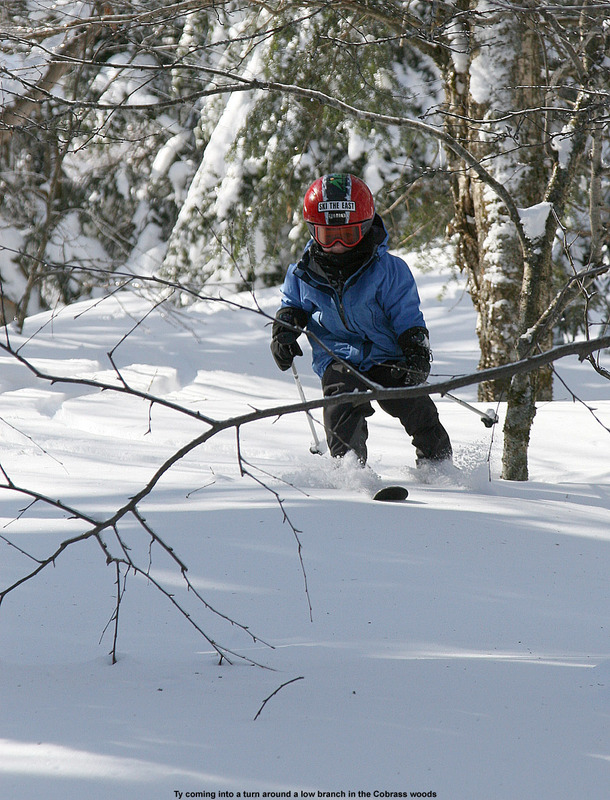 Most of the time was spent on the lower slopes of Spruce Peak, which offer great terrain for the boys to practice on their Telemark skis. With the low elevation and south exposure in that area though, it was quite warm, plenty of melting had occurred, and there were certainly muddy patches that required navigation to avoid. It sounds like everyone took the day casually though, and they had a pretty good time. Apparently a big attraction today was having snowball fights, which occurred over near the employee parking lot below Slalom Hill. E said the fights went on and on and on because everyone was having so much fun. Later in the day, E watched Ben while Mrs. Cabot took the girls for dance rehearsal/practice, and eventually everyone reconvened in the Great Room Grill to finish off the day. With the massive heat wave done, it doesn’t look like temperatures are going into the deep freeze, but they should at least return to something near normal and offer some chances for snow. There’s still time to rebuild some snowpack in the higher elevations, so it would be great if we could call on some storms to do that as we head into April. It’s been too warm for any additional snow recently, even in the mountains, but according to my records this is the first weekend/holiday period without powder since way back in the middle of December. 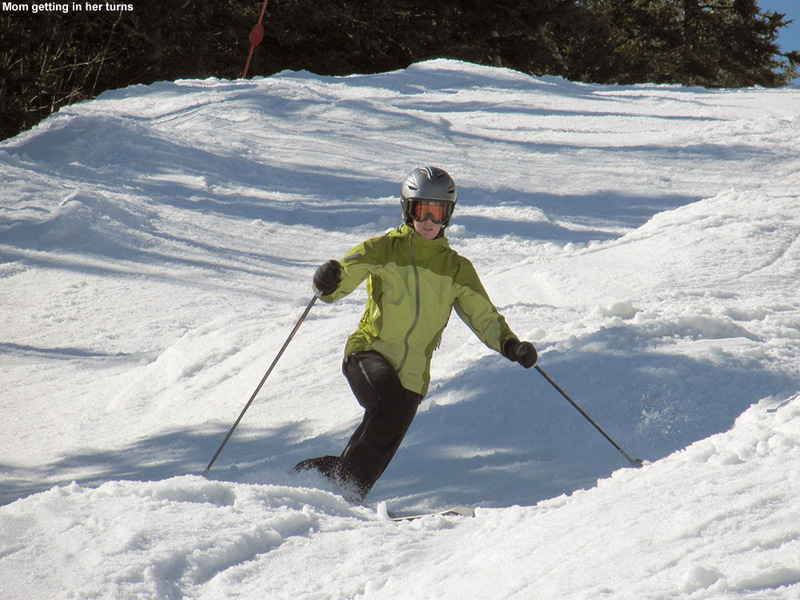 That’s actually pretty surprising in this season of warm temperatures and low snowfall, but despite the bouts of inhospitable ski weather, the Northern Greens have managed to continuously catch timely snow to revitalize the snow surfaces and provide powder skiing. Yesterday the boys had a good session of Telemark training at Bolton Valley, but today they were back on the alpines for our weekly ski program session at Stowe. 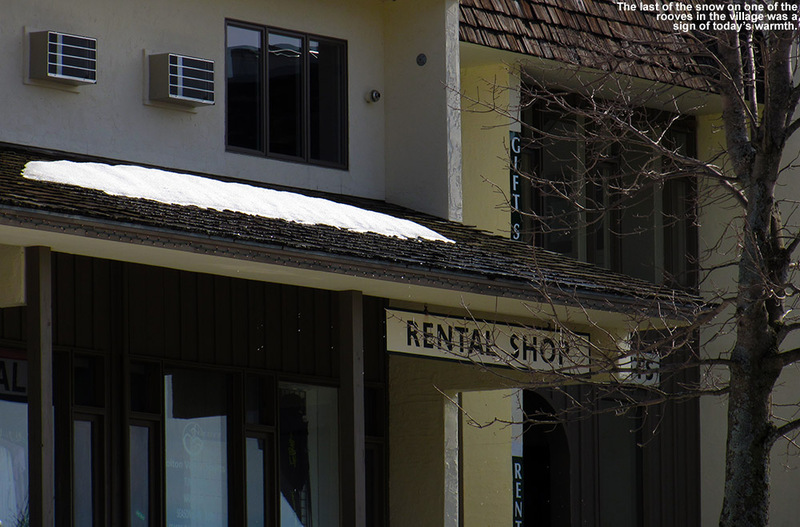 The resort didn’t seem to be too busy when we arrived today, as I managed a midday parking spot right in the first row near the Stowe Mountain Lodge. The boys and I met up with Connor and did an early run on Easy Street; its fairly mellow slope was still somewhat challenging for Connor as he’s just switched over to snowboarding this season. Snow on those low elevations, south-facing slopes near the Spruce Peak Base Area was quite soft and slushy, but at least it wasn’t overly sticky since it had long ago taken on that corn snow consistency. When our coaching group for the day finally assembled, it was just Luke, Ty, and Dylan for students, with Luke’s Dad joining us as well since he was out on the mountain today. 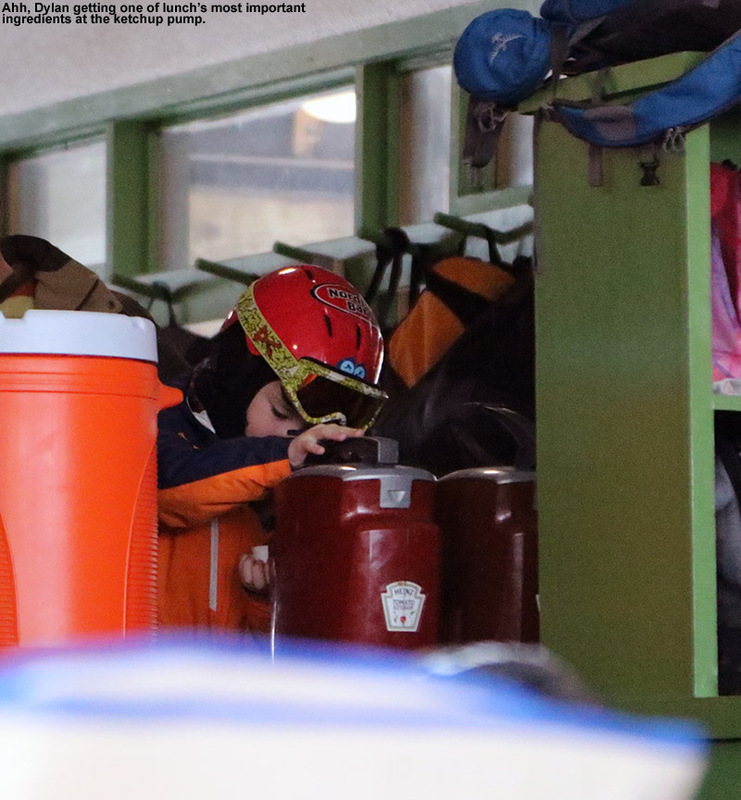 As the spring temperatures continued to surge into the afternoon, with 50s and 60s F on the mountain and even some 70s F at the base area elevations, the layers of ski clothing seemed to be flying off faster than people could do laps. We certainly weren’t immune to the warm temperatures, so as we headed toward the Over Easy we stopped in Spruce Camp and dropped some layers. The process took a few minutes because we also had to switch our ski passes out of our parkas as we converted over to vests. We kicked off our Mansfield turns with a trip down Cliff Trail, which we were happy to find full of bumps on its upper half. 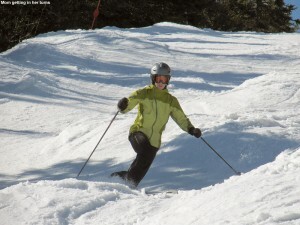 The skiing seems much better there with some contour, and naturally the bumps were loads of fun with the spring snow. We continued down onto Nosedive, and proceeded on our way to the Fourrunner Quad area – we’ve spent a huge amount of time on the Mansfield Gondola this season, so this was a chance to mix things up and get some time in the Front Four area. The quad actually wasn’t running because work was being done on it, but the Lookout Double was running as the alternative. We were happy that it was such a nice day though, because just as we were approaching to top of the lift, there was a five minute lift stoppage. Dylan was with me, and Ty was actually with a stranger, but he said he managed a fun discussion. Not surprisingly, the discussion included skiing. With the Front Four on our Minds, we headed right over to National, and the presence of soft spring snow meant that it was definitely time to hit the formidable headwall. The National Headwall is so steep that it often just turns into an icy mess that’s not worth skiing if the weather isn’t good, but that was not the case today. I was indeed excited to be atop National on a day like today. 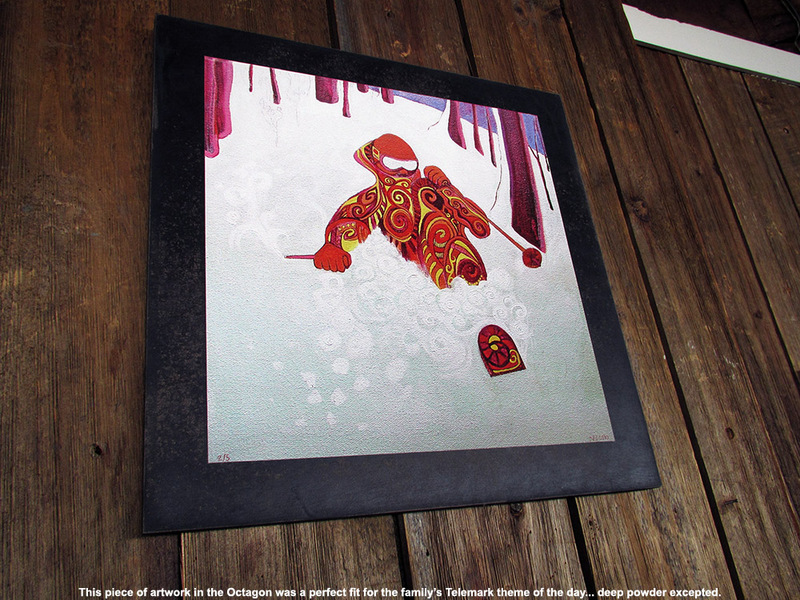 I straddled up to the precipitous edge, stuck my skis out into the air, and enjoyed the view beneath my feet. The pitch of the National Headwall doesn’t look like it’s quite 40 degrees, but with the way the catwalk above it is groomed, I’d say from experience that the first pitch is pretty darned close to hitting that mark. After eschewing the headwall under nasty conditions earlier in the season, I assured the boys that they could handle the slope easily with the good snow, and indeed they did. It was just pure fun letting the soft, steep turns just fall away with gravity on the upper headwall. 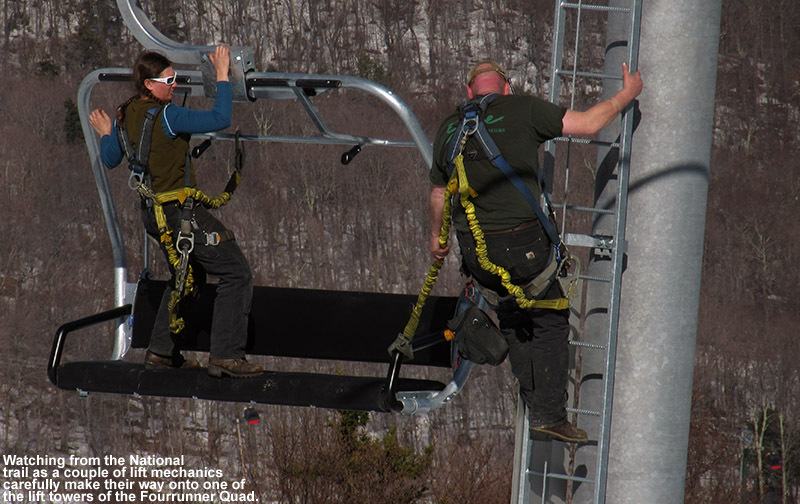 As we approached the junction with Liftline, we got an acrobatic demonstration of sorts – were able to watch a couple of lift mechanics transfer from a chair onto one of the lift towers. It was very cool looking down at them as they were perched precariously on the chair, accented by the image behind them, which was a view of the valley far below. We spent the rest of the afternoon on the Mountain Triple, making sure to catch a trip on Hayride, but also putting in a good dose of terrain park action at the request of the boys. We even managed a terrain park trifecta at one point, coupling the small park on Lord to the larger parks on Tyro and North Slope in one long run. The only downside we found to our “freestyle” terrain selection was that the resort didn’t build their huge half pipe this season, so we didn’t get to mix that in. 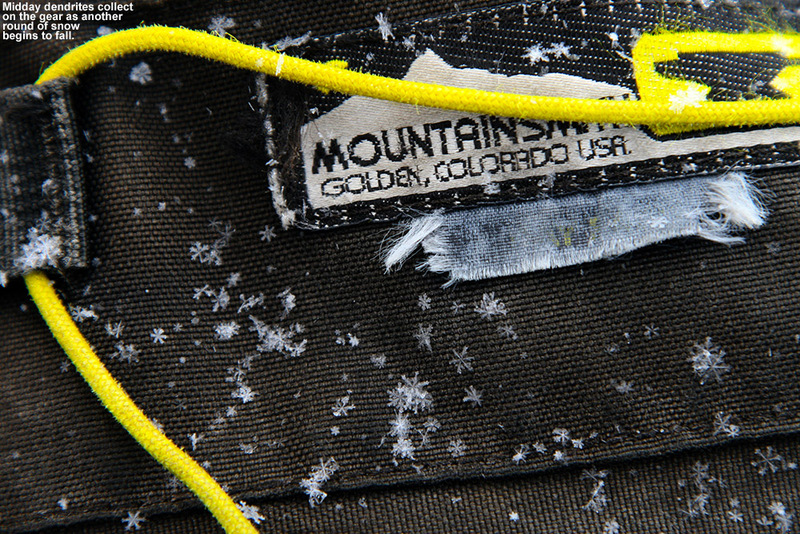 With the adhesive properties of the soft corn snow, we were able to really load up the tops of our skis with heaping helpings of it before getting on the lift. Ty, Dylan and I we were able to stockpile it that allowed us to throw a lot of snowballs during our ascents, as we worked on hitting the chairs that were descending on the other side of the lift. Hitting the skeleton-like chairlift frame, which is of course a moving target, while in a seated position on another moving object, is a fun challenge. Although Ty had the pole position on that one, putting him closest to the target, he throws lefty, so that raised the bar for him. 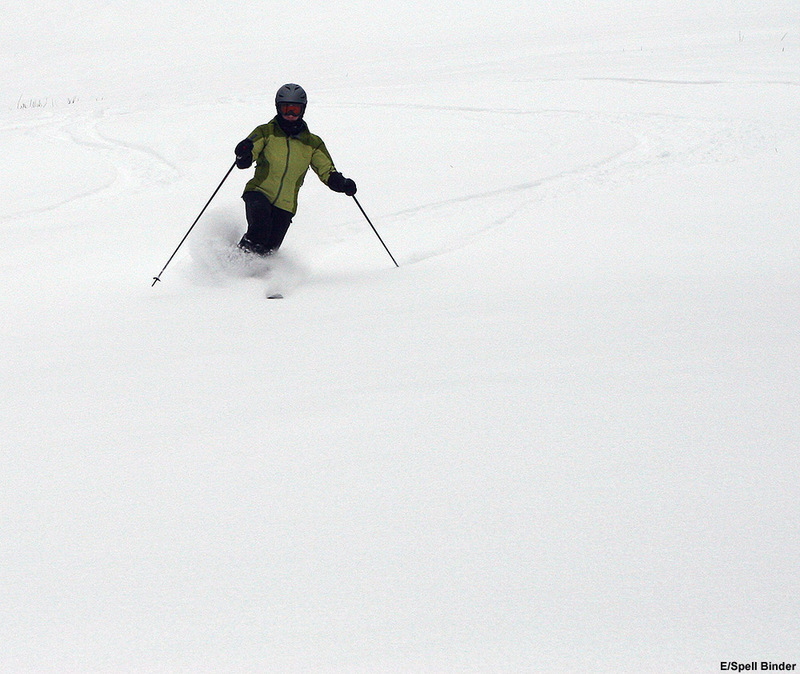 We skied almost until the lifts closed, winding up at Spruce around 3:45 P.M. where we called it a day. 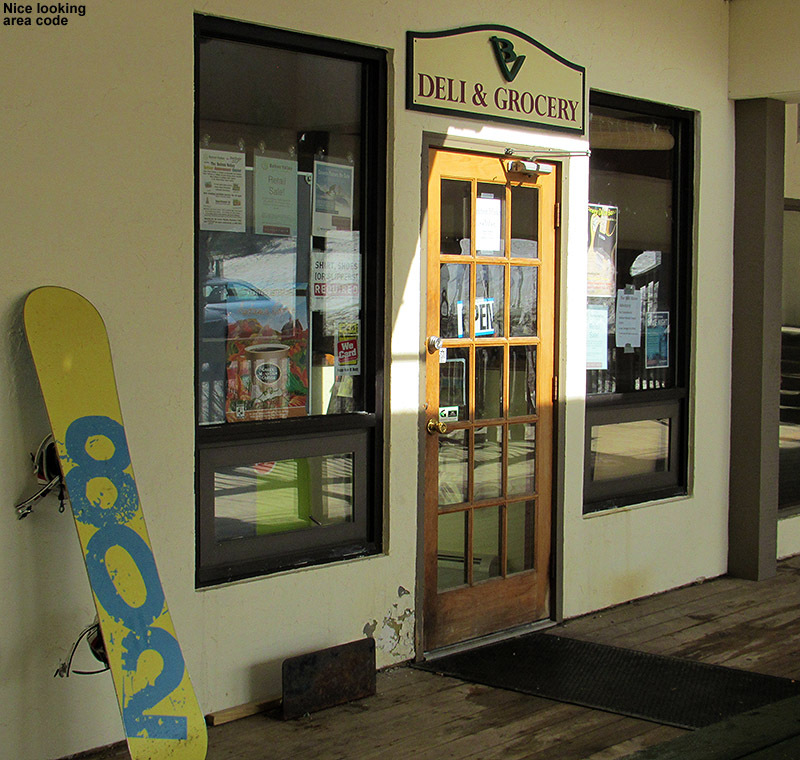 It was good ol’ Subway at the Alpine Mart today on the way home as the warmer season of après ski kicks into gear, and that closed the books on another fine day of Vermont spring skiing. Spring is definitely making inroads now that we’re into March, but last Saturday, winter was still in charge as we had a great powder day at Bolton with midwinter snow. 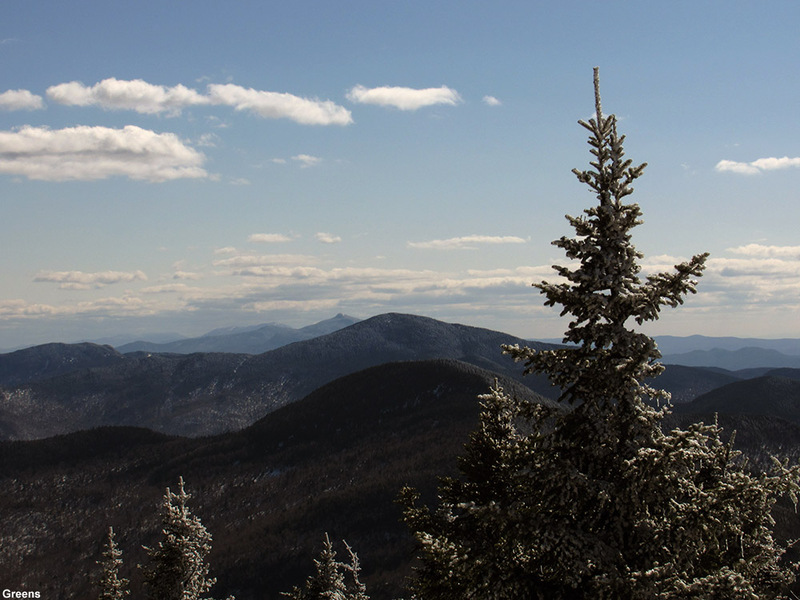 Today however, there was no denying spring its due, with a forecast for morning inversion fog in the valleys burning off to sunny skies and temperatures in the 50s up in the mountains. This looks to be the first weekend since back in early/mid December without local powder available, and it was a good opportunity to get the boys out on the Telemark skis for some practice on groomed terrain. E has wanted the get the boys out on their Teles for a while, and since they were excited about it today, we were hoping to seize that opportunity. Around 10:00 A.M. 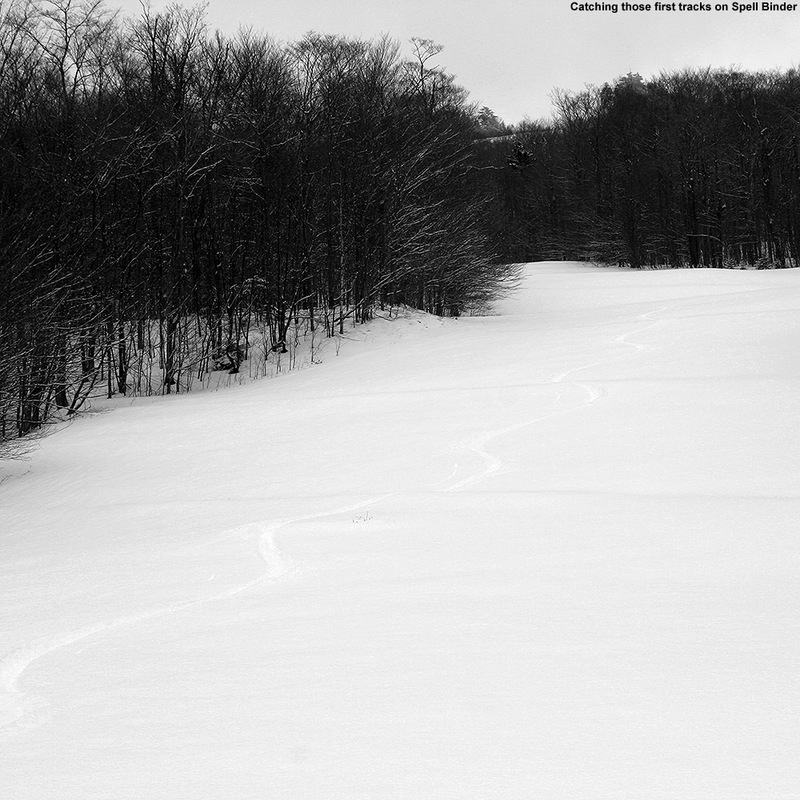 I checked on the Bolton Valley Web Cam to get a sense for how much the snow had softened, and I could still see a sheen out there on the slopes of the Butterscotch Terrain Park, so I knew it wasn’t quite time to head up just yet. Stephen also called us on his cell phone to let us know about the conditions – he was on the mountain and agreed that the slopes weren’t quite softened to that point of perfection. I’d actually just seen Stephen on the web cam, and was able to look at him in the image while we talked on the phone. We were certainly enjoying the convenience afforded by the new technology that the resort has added to the base area. Stephen let us know that the resort was pretty busy, and with the parking lots getting full, he was unsure whether or not we’d have to park down in the Timberline lot. As we approached midday, the fog in the valley had burned off, the weather was looking pleasant, and it was time to head up to the mountain. We were still torn on which ski gear to bring for the boys – I wanted to give them the chance to tackle the steep, and presumably soft, bumps on Spillway with their alpine skis, but we definitely wanted to capitalize on that eagerness to work on the Telemark turns. In the end, we brought both sets of equipment, and we figured we’d play it by ear once we’d seen how things looked on the mountain. We ended up with a good spot in the parking lot; we’d basically gone late enough in the day that some people were leaving and spots were opening up. 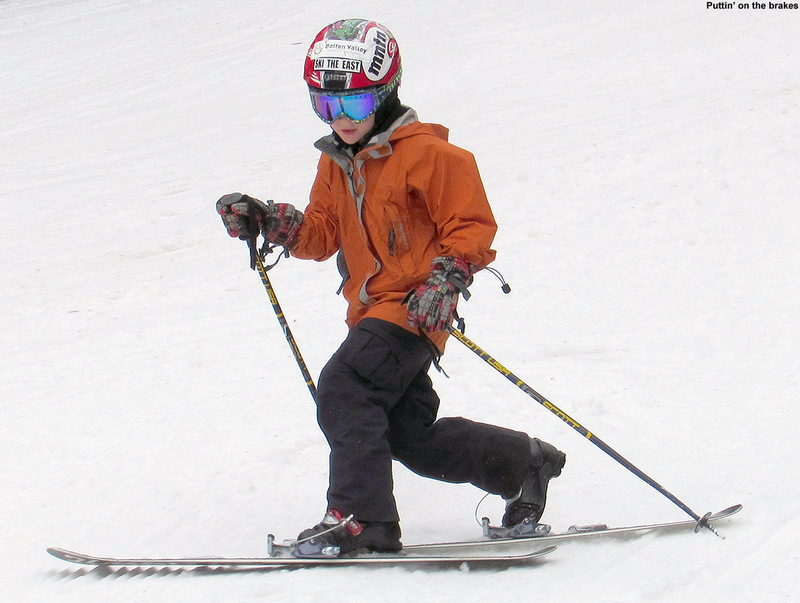 Since the boys were keen on getting in some Telemark skiing, we ultimately jumped on that opportunity and decided to have them go with their Telemark gear instead of alpine. We made several runs off the Mid Mountain Lift to get the ball rolling, and we had a good time coaching the boys with their turns. We worked on aspects such as fore-aft weighting and leg positioning, and tried to keep them from sitting back too far. Ty was really starting to self diagnose some of the issues himself, which was very helpful in making improvements. We stuck to mostly Bear Run for the consistent moderate pitch for learning, but also did a couple of Beech Seal runs to increase the challenge, and a Sherman’s Pass run from the top for variety. I shot various video clips throughout the runs we took, getting a chance to try out E’s new Canon PowerShot ELPH 510 HS camera. Her old Canon PowerShot SD700 IS from several years ago finally had to be retired from regular service since there was a crack in the LCD screen that made it unviewable, but it had served us quite well and we went back for a new one in the same series. In the five years since we got her last camera there have naturally been some huge improvements in the technology. This new Canon has a touch screen, a 12.1 megapixel sensor, which is twice what her old one had, a 12X optical zoom versus only 4X before, and most importantly for today’s ski outing, her new camera shoots full HD 1080p video. 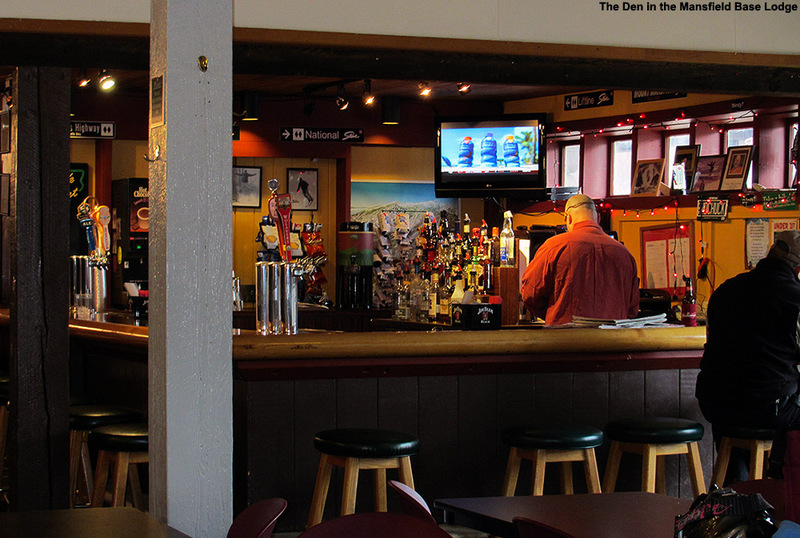 We took a mid afternoon food break when the boys needed it, and started out on the main deck beside the James Moore Tavern, where table service was an option. We quickly decided to move on though because it was so sunny and hot, and instead headed down to the Bolton Valley Deli & Grocery to sit outside on the covered deck. We got some snacks and drinks and started out sitting on some milk crates from the huge stack that they had at the east end of the deck, but the picnic table quickly cleared and we commandeered that. 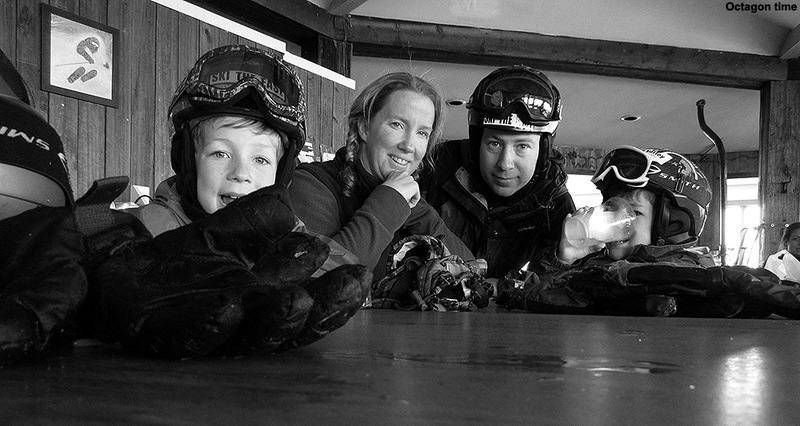 We weren’t even sure if the boys were going to want to go back out on the slopes, since working on Telemark turns in substantially more tiring that just ripping laps on the alpine skis, but we had time to rest and discuss the session we’d just had. Ty said that his toes were definitely getting worked, and that’s something that I’ve experienced when first getting up on those toes for extended periods of Tele turns. 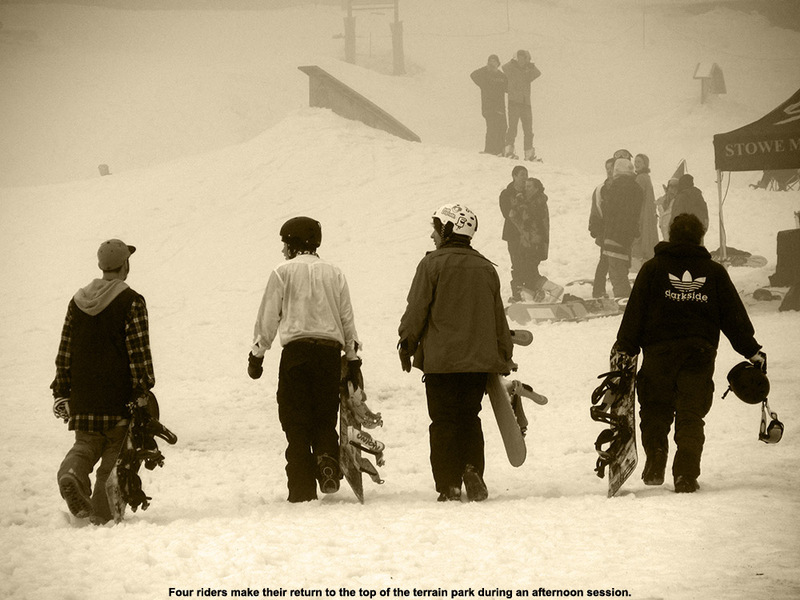 The boys were actually able to rest up enough that they wanted to go back out and make some additional runs. E and I were certainly excited about that, so we quickly got ourselves back out to main base area. While on the Mid Mountain Chair, I invented a way to use all the soft corn snow that was accumulating on the tops of our skis. I made snowballs from it and attempted to throw them hit the chair in front of us, which contained combinations of E, Ty, and Dylan depending on who sat with whom. All the chairs are moving at the same pace of course, so one doesn’t lose target distance in that regard, but it’s much harder to get a snowball to reach the chair in front of you than you might initially think. It’s a challenge to throw from a seated position, and, the chair in front of you is often elevated relative to the one that you are on. After many trials, I was finally able to hit a chair containing Ty and Dylan when E was away using the restroom. I eventually discovered that the spacing of the chairs on the Mid Mountain Chair is far from consistent – I was able to hit the back of chair 25 from chair 24 because they are quite close, but many other chairs were farther apart. We had a greater focus on Beech Seal in that second session, and I was able to work on my own Telemark turns in the leftover ruts from the race course. That was quite challenging because the ruts were almost like the corners of a bobsled track by that point, and you were really locked into taking that fixed, fairly aggressive line. It was indeed a pretty challenging line, but by my last run I was really starting to get it. You had to hang on, carve hard, and have confidence that you were going to hold through the entirety of the sharp arc. I was amazed that the boys were trying it with Telemark turns as well, but they clearly wanted to see what it was like, and could manage in the flatter sections of the course where the turns weren’t as aggressive. It was well after 5:00 P.M. before we finally called it quits, but it was hard to pull away from such a beautiful day with temperatures in the 50s F. I love how the mountain keeps things running a little later take advantage of their western exposure and the long lasting spring sunshine. The boys definitely made a lot of progress on their Telemark turns though, so the whole afternoon was worth it even beyond the chance to simply be outside on the slopes. It sounds like we could be in for quite a warm one this week, with some temperatures in the valleys getting up near the 80 F mark, so we’ll really have to hope that the slopes can handle some melting if that forecast comes to fruition. It started snowing on Friday night thanks to our most recent upper level low pressure system; it was yet another storm that was brilliantly timed to set up the slopes for the weekend, continuing a trend that seems like it’s been in place for several weeks. 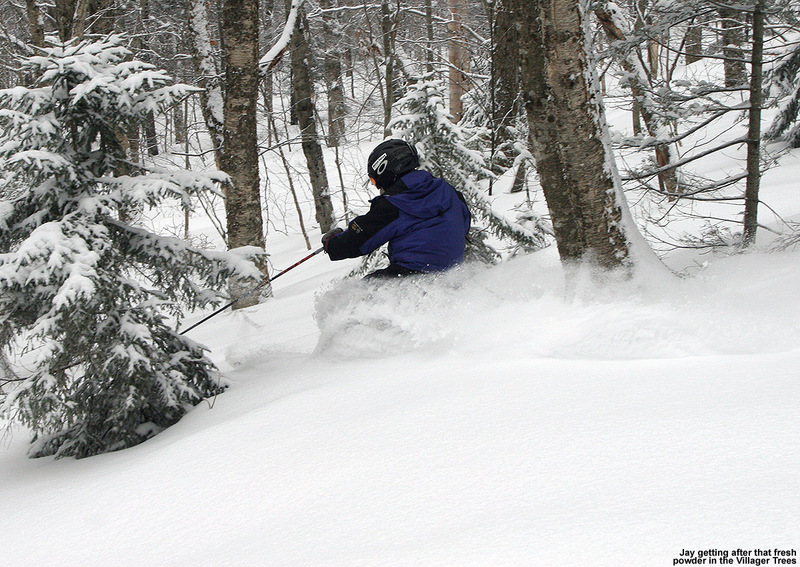 The Central Vermont Ski Areas were the focus for this latest storm, topping out with over a foot of fresh snow, but even the Northern Vermont Resorts reported accumulations passing a half foot. We made turns at Bolton yesterday, finding a nice round of powder in which to play, even if the effects of previous warm temperatures could still be felt in spots. Today we were back out at Stowe, and we were set up for a nice one with overnight lows in the 20s F to keep the powder in good shape. We arrived at the Spruce Peak Base around 12:15 P.M., and after dropping off E and the boys it took me a couple of circuits of the parking lot to get a spot – a very nice one eventually arose right near the Stowe Mountain Lodge just a couple of rows out from the Stowe Mountain Club parking area. So, I’d say that based on parking, the number of visitors to the resort today was ample, but pretty typical. Temperatures were expected to climb above freezing as the day wore on, so when I got my students for today, which were just Ty, Dylan, and Luke, we headed right over to the Mt. 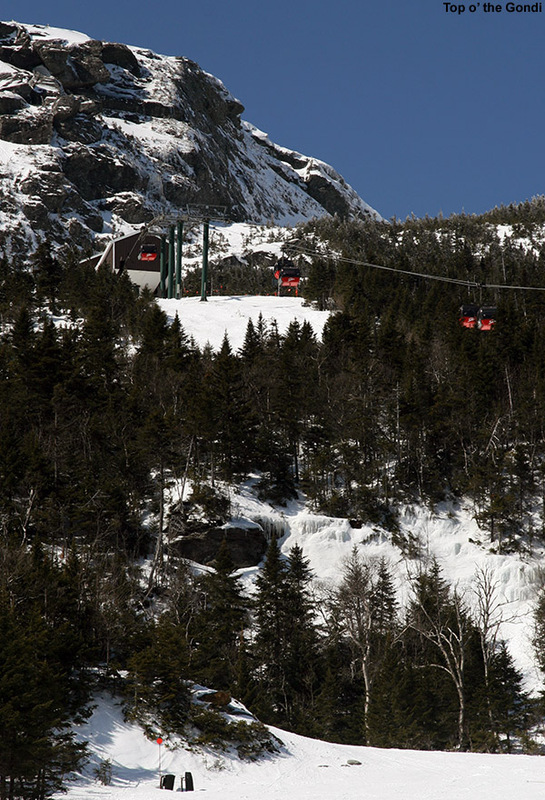 Mansfield Gondola area to take advantage of the elevation it offered. We were thinking of checking out the Kitchen Wall as long as the snow wasn’t getting thick, but Dylan requested a warm-up run first, so we had a good trip from Cliff Trail to High Road to Switchback. Indeed there were spots where the snow was already starting to get sticky, but the presence of sun was the key factor sending it there; staying in the shade made all the difference, and one could actually tune their skiing to be in their desired level of snow firmness depending on how deep they went into the shade. Having assessed the snow, we did head to the Kitchen Wall for the next run, and the shaded spots were still holding winter snow, although some thick snow did have to be negotiated. 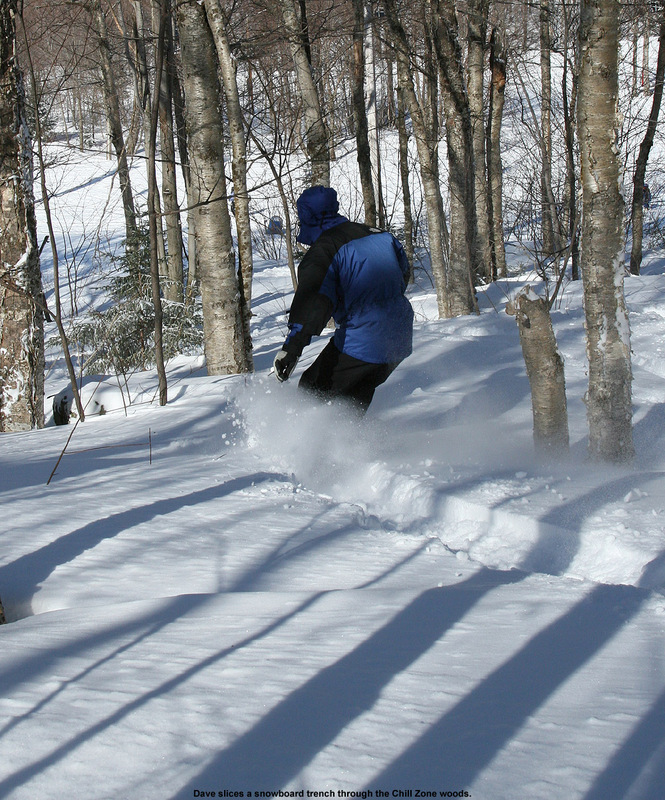 There were certainly areas of nice, untracked powder to ski in the spirit of what we found yesterday at Bolton, but for the best ride you had to be careful not to get into snow that had never been hit by the sun. 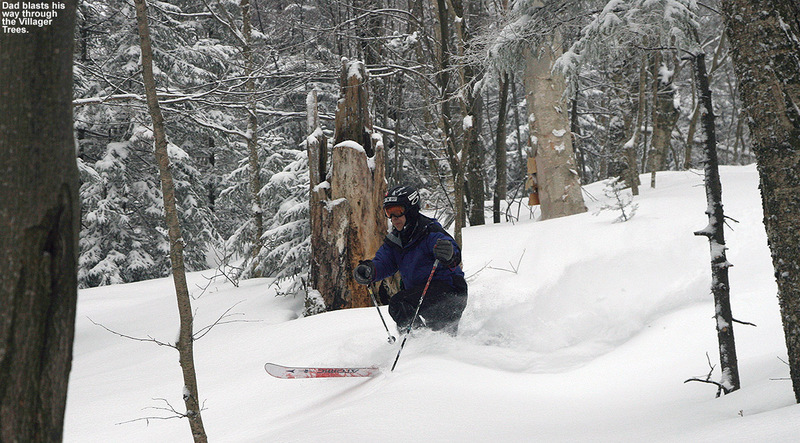 We continued on through the Nosedive Glades to Nosedive, and the on to Liftline to get to the Fourrunner Quad. Conditions continued to be that mix of dry, winter-style and softer, spring-style snow, but as long as the soft stuff wasn’t too wet, it really did make for some nice skiing because you could sink and edge into it like nobody’s business. That incredible grip was building confidence that we were ultimately going to test at high speed. We made one quick run off the Fourrunner Quad, visiting some pretty steep terrain on National and Liftline before returning to the Gondola. 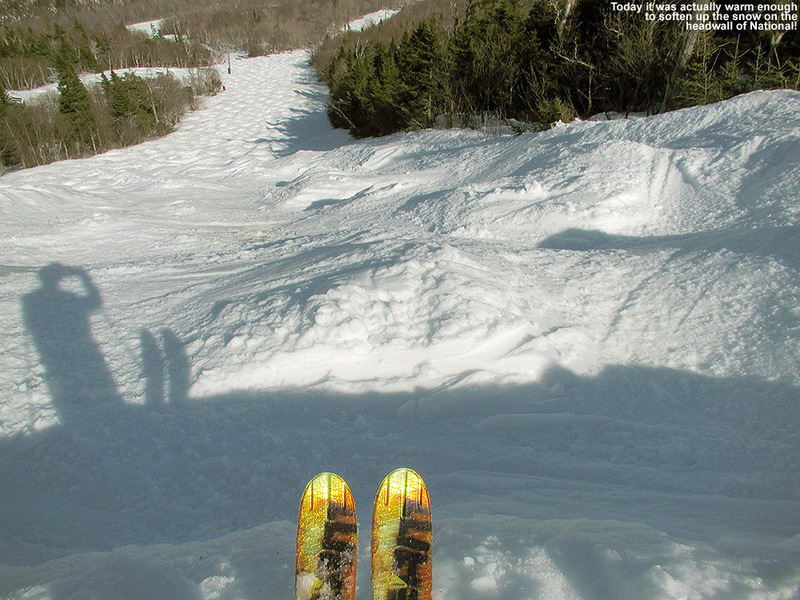 Everyone was game for a run down the moguls of Chin Clip, so we had a long run of bumps that got everyone a workout. Back at the top of the Gondola again, we started out on Perry Merrill, and I proposed a run down the Tombo Waterfall, but Dylan said he was too tired for that. I’m glad that he was able to tell that he was too tired for that run instead of just muddling through. The rest of that run on Perry Merrill turned out to be quite an experience though, because it was virtually devoid of any other skiers and we turned on the afterburners. I led the boys down at mach speed, carving huge arcs with radii of probably 150 feet. The speed was a little intimidating at times, but the groomed snow was so good that you knew it was going to hold, and the only limits were your legs. 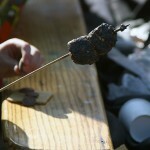 Back at Spruce at the end of the afternoon, the fire pit area was roiling with children and adults at the s’mores session. Perhaps the warm weather had everyone especially exuberant to be outdoors, or maybe the food supplies were more plentiful than usual, but the place was definitely hopping. I had time to capture a number of images of the scene, and with so many photo opportunities, that process was as much fun as eating. 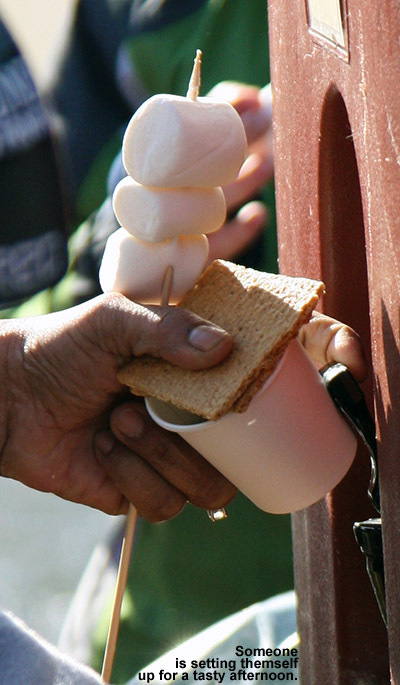 Ty get set to devour some toasted marshmallows today among a sea of other visitors around the Spruce Peak fire pit. On the way home, we stopped in at Harvest Market on the Mountain Road to grab something to eat. We’d been there once before when we were in town for an event, but we decided to check it out as a potential place to get après ski food. It’s definitely got that Vermont/local foods/gourmet slant, so prices aren’t going to be as low as what you’d typically find at a convenience store, but of course you’re getting food of a totally different caliber. They’ve got a deli counter with meats, prepared food options, etc., and what immediately grabbed our attention there was the assortment of samosas; E and I enjoyed ours immensely, and they’re about as easy to eat in the car as one could want. The boys shared a stick of local Vermont pepperoni, which they devoured in the back seat. Space inside at Harvest Market is pretty tight; they’ve packed most of the items you’d expect to find in a small market into a pretty minimal footprint, and the deli section takes up roughly half that area. I’d say the overall feel is one of combining a Vermont country store with a gourmet food shop, so naturally it fits right in at Stowe. I’m sure it would be pricey to do a substantial amount of your weekly shopping there, but of course you’re paying a premium to get items that are often locally sourced. After our experience today though, I’m sure we’ll be mixing it in as one of our options after a day on the slopes; it’s a fresh alternative to throw in with restaurants and the usual convenience stores. I hear the temperatures are warming up in the area this week, so this may be the last of the winter conditions on the slopes for a bit. We’ll see what we get when we’re at the mountain next weekend, but I’d certainly say that we were able to enjoy what Mother Nature offered today. 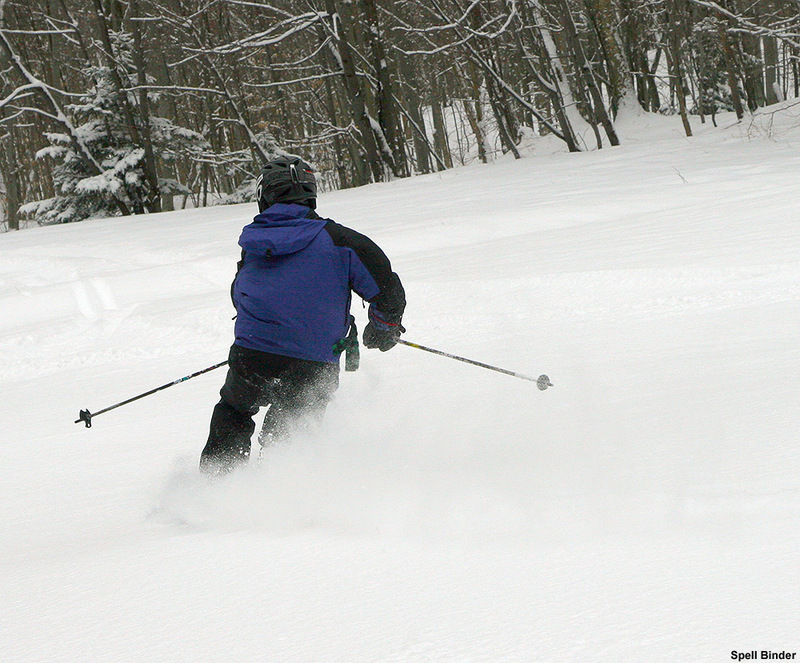 Today kicked off another weekend of March powder at Bolton Valley. 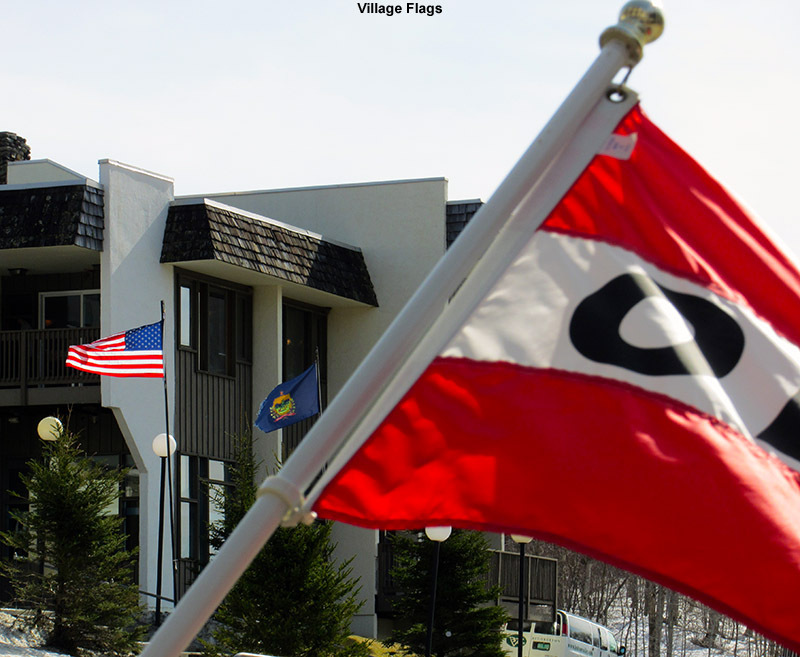 Earlier this week the Northeast experienced its warmest weather of 2012 to date, with the feel of spring in the air as temperatures reached well into the 50s F in the valleys of Northern Vermont. Seasonable temperatures resumed on Thursday night however, with a strong cold front passage that produced winds as high as 96 MPH on Mt. Mansfield and brought along a few inches of snow to the mountains. This frontal passage was followed by a small upper level disturbance that brought more snow as it came through the area last night. 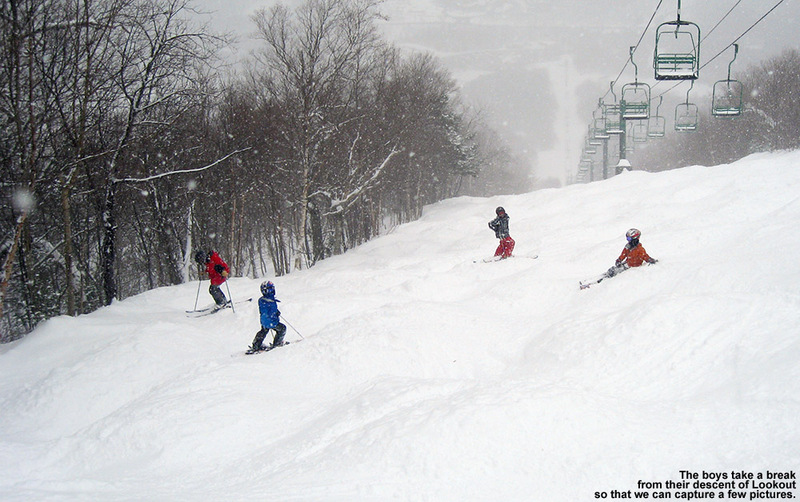 Snowfall totals weren’t expected to be more than an inch or two, but many of the Vermont resorts picked up several additional inches of snow, with some of the Central Vermont Ski Areas topping the accumulations list at around a foot; Sugarbush reported 11 inches of new snow overnight to bring their 48-hour total to 15 inches. The additional snowfall that hit the area last night brought roughly a foot of snow to the Green Mountains on the east side of Addison County - the areas receiving the most snow can be seen in the magenta coloring near the center of the map. Unsure about how much snow was coming, we didn’t have any hard and fast ski plans for today, but when 4.4 inches of snow had fallen at the house by this morning, and Bolton had tacked on another several inches to their Thursday night totals, it called for hitting the slopes. The Vista Quad was loading at 8:30 A.M., and the new powder got the boys motivated enough that we made it up to the Village only 5 to 10 minutes after that. I dropped E and the boys off in the Village Circle, and easily got parking in the top tier of the Village lot – we’re into March now, so many people are thinking warm weather activities, and today wasn’t really forecast to be a significant powder day either. 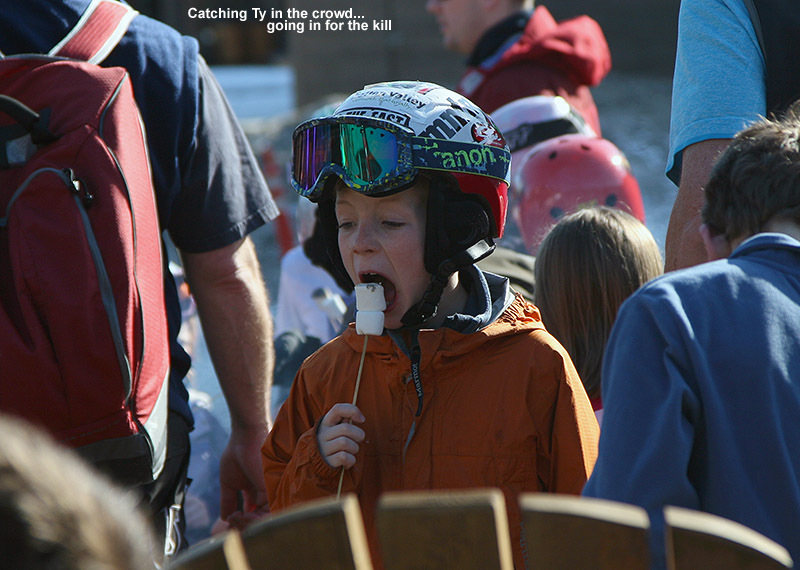 With that combination I wouldn’t expect it to be a very busy day at the mountain. The base area was indeed very quiet as we loaded on the Vista Quad for our first ride – Jason and the other instructors were out for their early training/clinic runs, and let us know that conditions were great. It was cloudy, with the cloud ceiling dipping down just low enough to skim the peaks up above 3,000’. Temperatures were in the mid 20s F, and there was no wind. 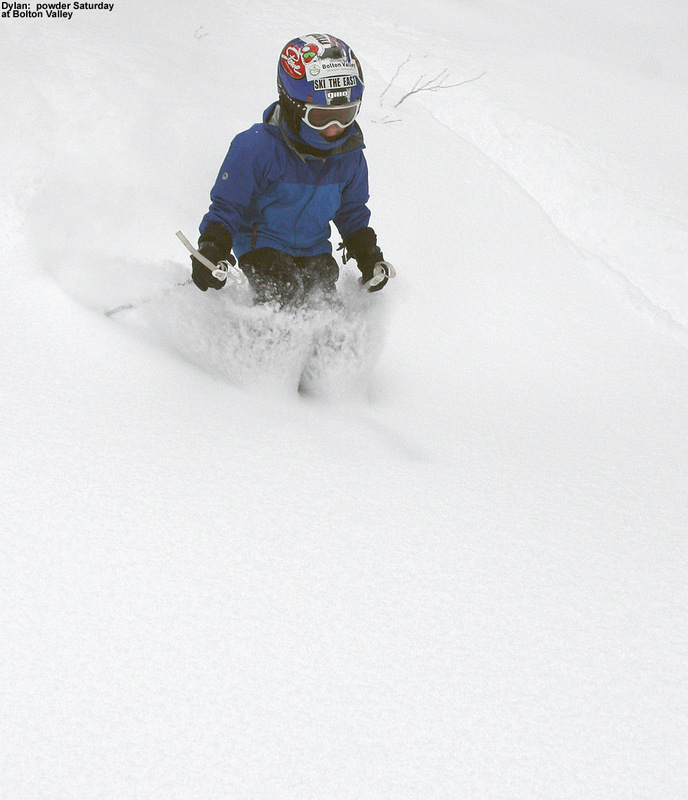 The midweek warmth and return to cold had hardened up all the subsurfaces, and with only modest amounts of snow since then, we knew that moderate and low angle terrain was the best way to go for bottomless powder turns. We were encouraged by what we saw beneath our feet as we cruised along on the quad though – the morning’s initial tracks had the look of a respectable powder day. 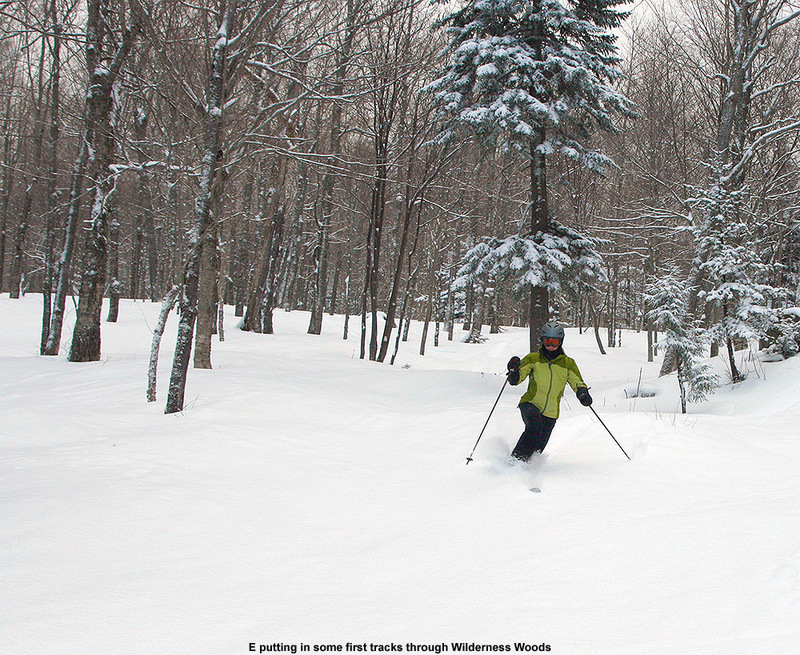 With moderate terrain and fresh tracks in mind, we set our sights on a trip over to Wilderness, since the lift hadn’t been fired up since last weekend. Right from the Vista Summit, we had a chance to check out the float in the fresh powder as we ventured skiers left on Spillway Lane. The snow was very nice, with no effects from any sort of wind; we actually found ourselves in some quality Champlain Powder™. That first pitch was a perfect spot to see how all our skis performed in the snow at hand. I found myself touching down occasionally on my RT 86s, which have only an 86 mm waist, but that shovel up near 130 mm really helps with the float. 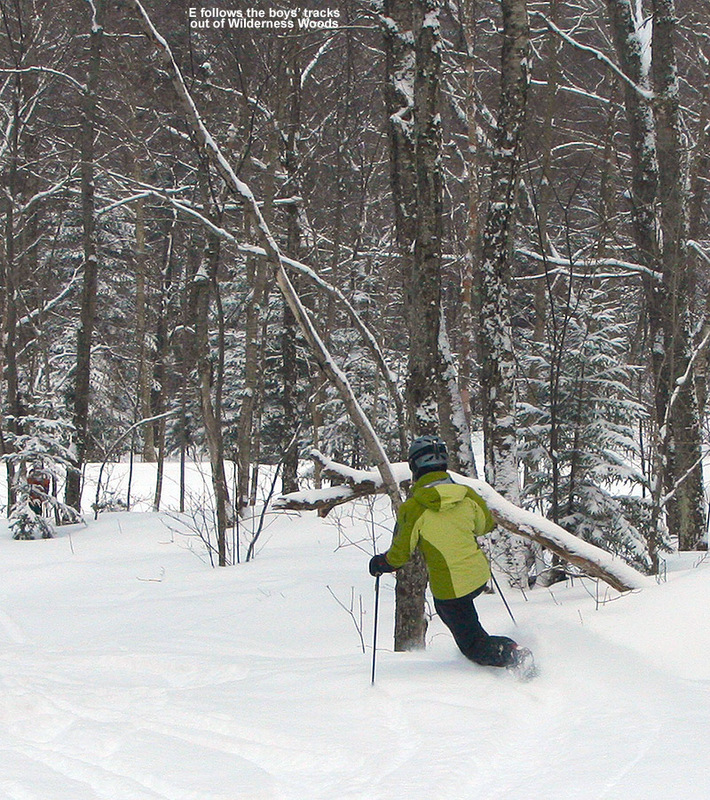 E’s Telemark skis are pretty skinny, with 10 mm less width all around, so she may have touched down a bit more. For the boys though, who were on their twin tip/fat skis that have the equivalent of a ~130 mm waist at adult length, floating was a piece of cake. They boys don’t weigh very much of course, so combine that with wide skis and they’ve got it easy, but E and I are definitely keen on getting some fatter Telemark skis because we continue to see the benefits even on these small to moderate powder days. We continued on Sherman’s Pass, carving some turns in the new powder off the edges off the trail, and then turned onto Swing around the 2,800’ elevation where I used the sheltered area to check the depth of the powder. 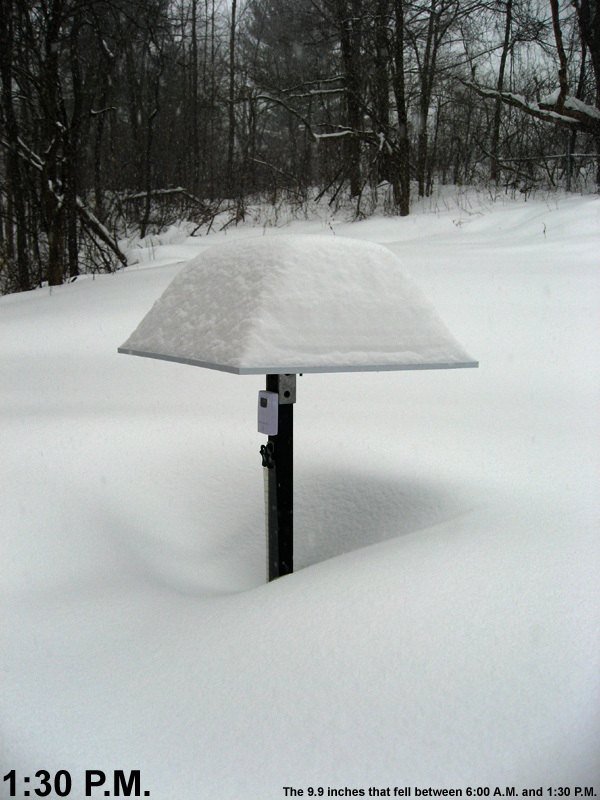 The depth came in right around 7 inches, presumably representing the accumulation from the past couple of days. Work Road was pleasant with the usual areas of powder, and then once over at Wilderness we headed down part of the Wilderness Lift Line and into Wilderness Woods. Turns were very nice in there, as the pitch fit the amount of new snow nicely, and I could see that E was enjoying the Telemark turns. 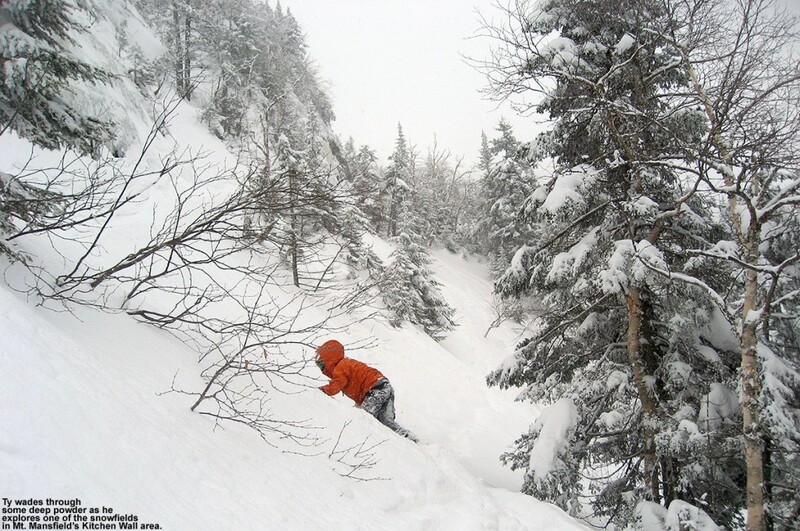 We exited out onto Lower Turnpike and finished the run through the powder along the edges. Dylan tests the waters in the Villager Trees and finds that that indeed things are quite fine. Upon checking in at the base of the Wilderness Chair, the lift operator informed us that it would be opening at 10:00 A.M. We made a mental note, and traversed over to the Vista Quad for another run. I was planning on another run in that moderate pitch category, and we opted for Cobrass to get us down to Five Corners or enable us to check out some of the trees in the area if the snow was good enough. The skiing in the Villager Trees turned out to be very nice on all but the steepest pitches, so we really enjoyed that. By the time we’d finished there we noticed that the rope had been dropped signifying that Timberline had opened, and we had to make a decision between heading there or to Wilderness. It didn’t take long… we were right there at the access point for Timberline and the whole area was going to be essentially untracked. It turned out to be the perfect choice. On our way down to the Timberline Base we ventured through Lower Tattle Tale and were the first ones at the top, so fresh tracks were had all the way down. I’d been concerned about how deep the powder was going to be around the 2,000’ elevation range and below, but there were a good 5 inches of fluff in which to float, so there were plenty of bottomless turns. 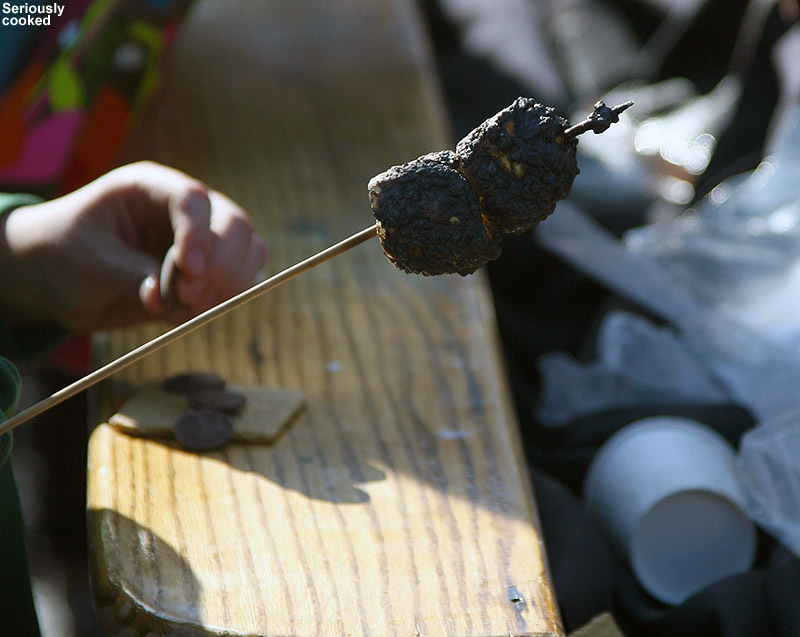 Once we’d experienced that, we knew we’d be spending a good amount of time at Timberline. As we were finishing off the run I cut over onto Lower Spell Binder, and was the first one on there for the day. For fun I took a line right down the middle, and the turns were stupendous; I showed Ty the tracks when I met everyone at the bottom and he agreed that we should do more of that. It was already starting to feel like one of those semi-private Timberline powder days. 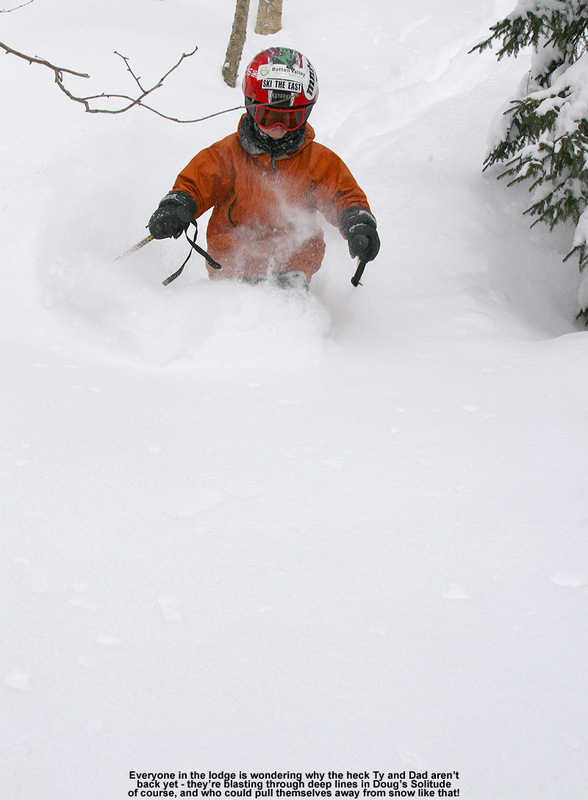 The late morning was starting out as one of those semi-private Timberline powder sessions. At the Timberline Mid Station we saw that the headwall of Spell Binder was closed, so we did a run in the Wood’s Hole Glades. The glades had seen just a little traffic, and it was a delight to watch Dylan silently and fluidly navigate his way down the entry line. Soon after, E got her timing banjaxed from the get go, and struggled her way down the same line. We laughed about how that one misstep at the start can leave you out of synch for the whole segment. The snow in the trees was good, but even better was the untracked expanse of Spell Binder that we eventually caught below; that was just the pitch for the snowfall we’d received, and the powder turns seemed endless. 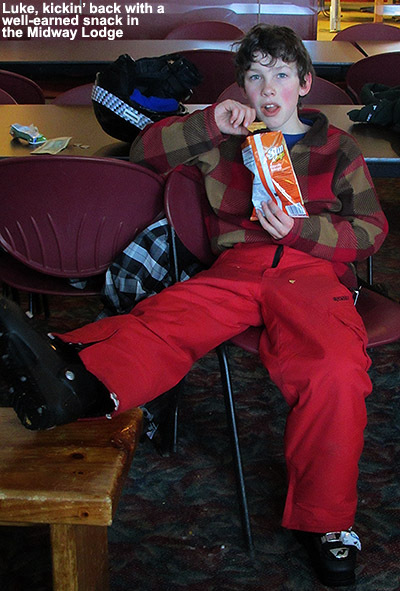 We agreed that it had to be done again, but the boys were calling for a snack break, so we popped into the Timberline Lodge for a few minutes. It was very quiet in there, with just a couple dozen ski bags and a few people; I’m sure most folks were out enjoying all the powder. Once back out on the slopes, my plan was to check out the Corner Pocket Glades, which I expected to have an excellent pitch for the amount of powder that was around. 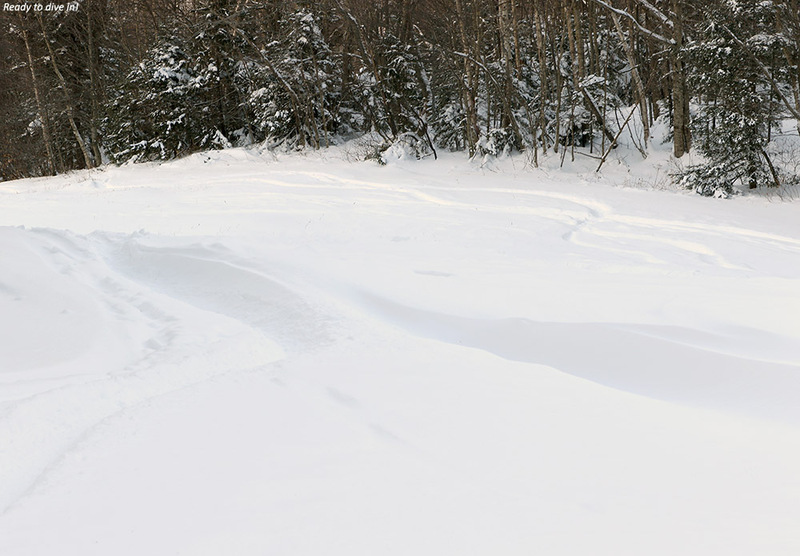 Unfortunately, the surface in there was somewhat irregular for whatever reason, and it would have taken a few more inches of snow to really get the glades into prime form. E had trouble getting into a rhythm on her Telemark skis, and had a pretty good crash near a tree. Although the boys had no issues at all on their short, fat, alpine skis, I could feel the difficulty in the snow as well on my Teles, so once E had crashed we decided to clear out and head for open terrain. We worked our way over to Spell Binder, and in terms of snow it was like night and day. The skiing out there was so effortless and sweet, it was hard to imagine what had gone on in the trees to make things so difficult. 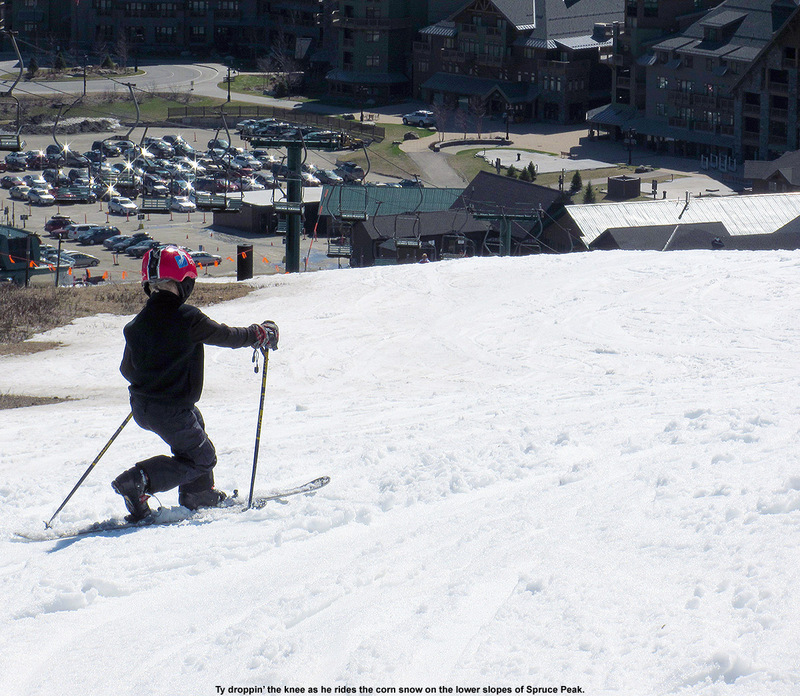 Perhaps the more even distribution of melting/freezing on the open slopes made everything that much smoother. In any event, at least we discovered that quickly and got to enjoy a long run of turns out in the open. The boys were getting antsy, so we headed back toward the main base area at that point, catching some turns off the sides of Villager. E was a keen powderhound and caught some nice looking turns off to the skier’s left. Ty and I made some extra powder turns in what has become an almost perfunctory little line from Timberline Run down to Villager – I warned Ty about the drainage swale at the exit, and he fluidly found a nice little snow bridge back to the trail. 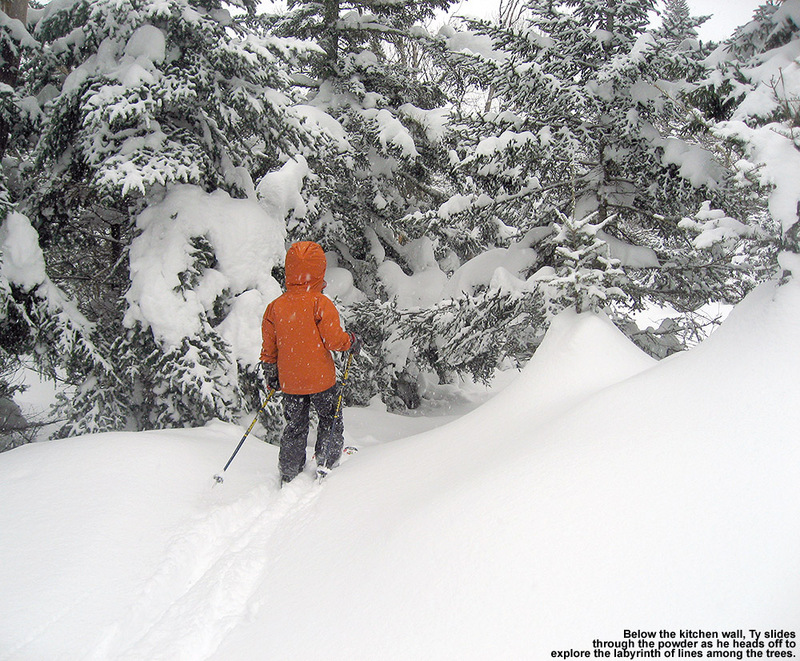 Although the boys were anxious to get home, it was easy to entice them with a Snowflake run, so we cut down Lower Foxy and were able to glide through the powder in all the untracked areas. 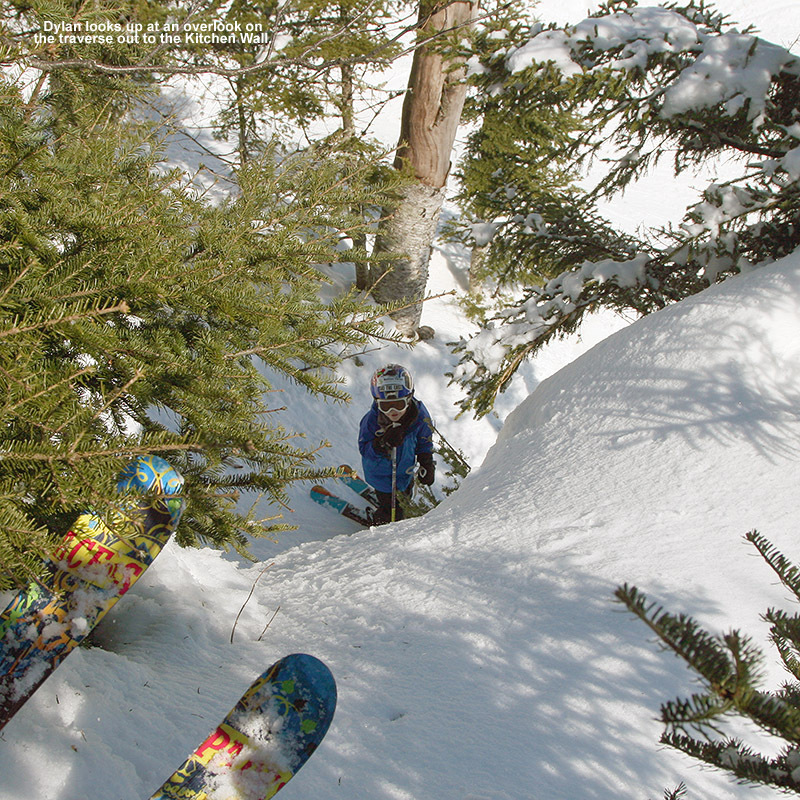 Ty and Dylan even headed off into some of the trees that they like to explore along the lift line. 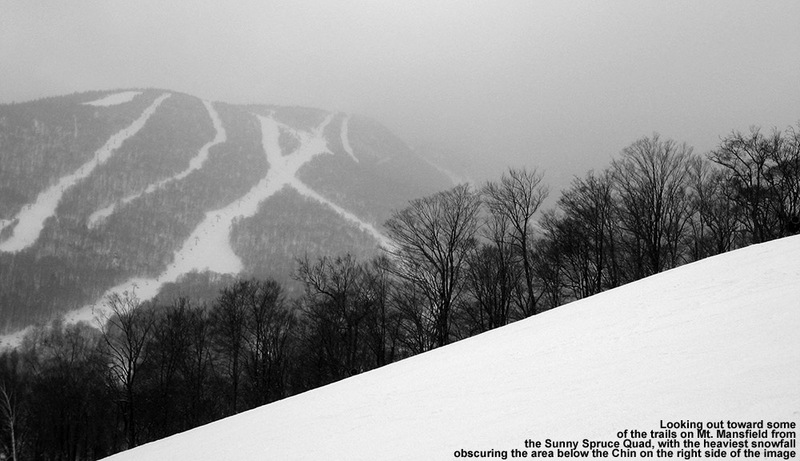 Lower Foxy had delivered as usual, with not a single track in its powder stashes even though it was almost noontime. 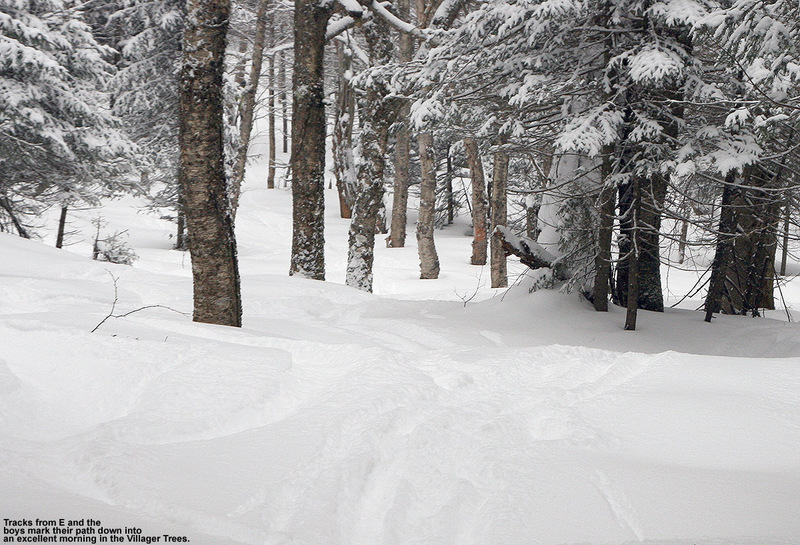 The powder was skiing so well that I decided to keep the party going and take E and the boys through the Bonus Woods. That area has always had some decent lines, but we’ve helped to spruce them up over the past couple of seasons with patroller Quinn and the rest of the Bolton Valley Glade Enhancement team, so turns were pretty facile and E cruised through smoothly even on her Telemark skis. That run meant more first tracks and everyone seemed to be pleased with the run as we popped out near the Vista Quad. 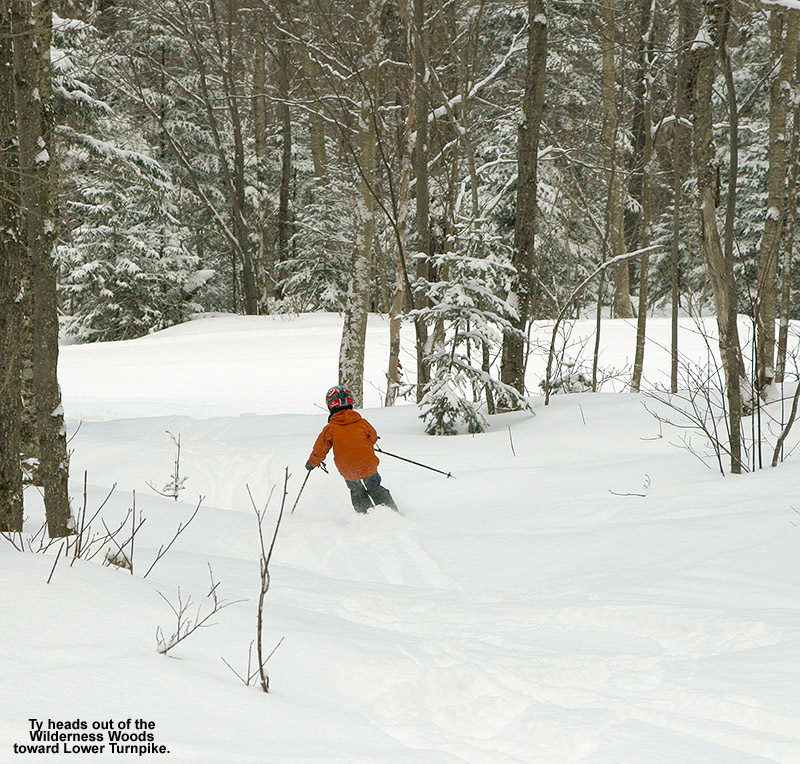 E and Dylan headed back on piste, while Ty and I headed toward Butterscotch – for me it was a chance to ski more powder along the edge of the park, but Ty sought out some box sliding on the features. Another round of snow had started to fall as we approached midday, and as the family regrouped in the space between the bases of the Mid Mountain and Vista lifts, we had to make a decision. The conditions were too good to easily pull ourselves away, but the boys were ready to go and were making that quite apparent. We debated for a couple of minutes, with E and I certainly willing to stay and enjoy a few more runs, but having a birthday party to go to at my parent’s place in the evening and some associated food shopping to do was enough to tip the balance. 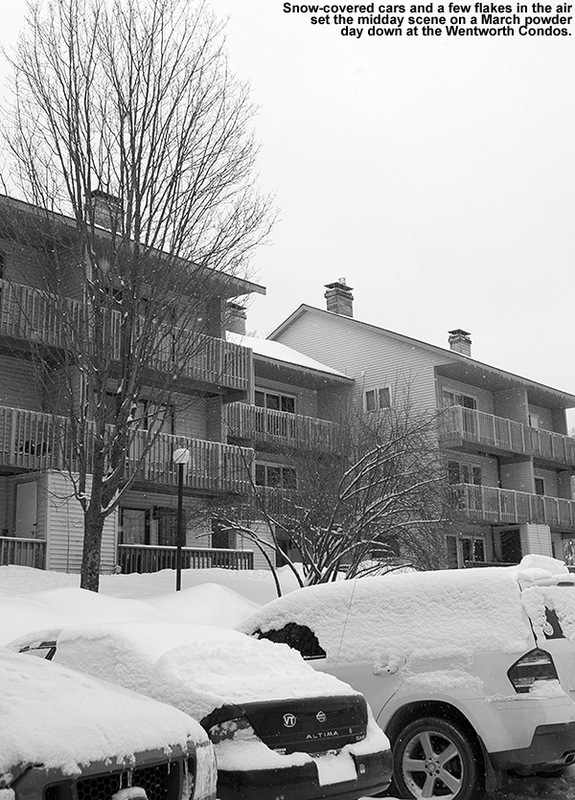 We skied down to the Wentworth Condos and took our time strapping together the skis as we soaked in the midday scene on this wonderful powder day. 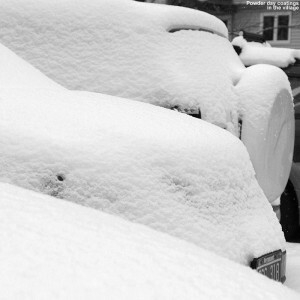 An occasional car would come or go, many were covered with a fresh blanket of white, and a light snow was falling composed of exquisite flakes. I even had time to take a few photographs while the boys played around on some of the snowbanks. Finishing up with the skiing on a powder day is always a little bittersweet; it’s hard to pull away knowing that there are more great turns available out there, but there’s also that physically and mentally relaxing/exhausting feeling of completing such an enjoyable activity. We were definitely efficient this morning, skiing miles and miles of untracked powder, hitting the right terrain, and getting over 600 photos in the process. All of that came from what was a bit of a surprise powder morning, and even if it wasn’t the deepest powder on record, with the whole family together it will go down as one of our favorite days of the season. It was still in the mid 20s F with the clouds hanging around on the mountain, but when we got back to the house down in the valley, a beautiful spring afternoon was underway with full sun and a temperature that had already risen to 40 F. Indeed it was a pretty classic Vermont spring powder day. This morning saw milder temperatures than what we’ve had in the past few days, but it was still 28 F at the house when I made my observations at 6:00 A.M. It was a beautiful morning, and since I had to take the car to Burlington for some errands, I decided to stop off at the mountain for some turns on the way. Heading up the Bolton Valley Access Road around 8:30 A.M., the temperature actually rose somewhat as I ascended out of the valley, but that must have just been a warm layer in the middle elevations, because the temperature dropped again as I approached the Village (2,100’) where it was still below freezing. With the Vista Quad being the first lift planned to open at 9:00 A.M., I was still somewhat ahead of that time even with my procrastination at the house, so I continued with my plan of skinning up for some earned turns before riding the lifts. With opening so close, I kept out of the way of potential skier traffic by ascending on Lower Fanny Hill, and I found 1 to 2 inches of new snow at the base elevations. I hadn’t gone too far up Fanny Hill before I realized that lift service was underway, so I removed my skins, stowed them in my pack, skied down, and caught a ride on the Vista Quad. Up above the 3,000’ level, snow accumulations were generally in the 2 to 4-inch range, but I even found some depths up to 8 inches that weren’t obvious drifts. I was still looking to earn some turns in the fresh snow, and since the Wilderness Lift hasn’t been open since Sunday, I pulled the skins back out and made my way up to the Wilderness Summit. When I arrived at the summit (~3,150’) I noticed that the snowpack was close to level with one of the benches up there, and with typically a couple more weeks of snowpack gain to go based on the Mt. Mansfield Stake Data, that’s a good sign of how the higher elevations have caught up from the slow start in terms of snowpack. So despite the lame initial stages to snowpack building this season, the storms of the last couple of weeks have really helped it catch up to near normal in the highest elevations. 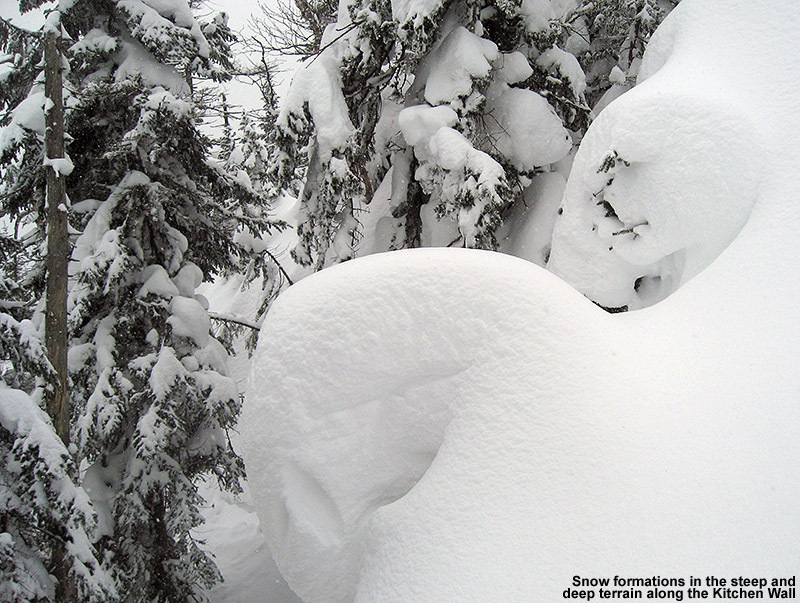 Several feet of snowpack at the Wilderness Summit mean that the Powderbank bench is close to getting buried. 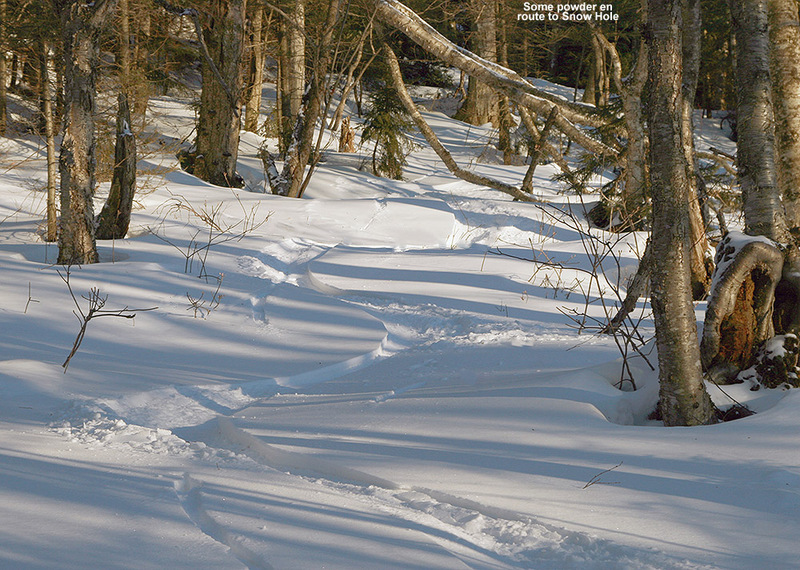 I opted for a run on Peggy Dow’s and Lower Turnpike, where I found plenty of nice powder, but it was good that I was out rather early, because the day was warming up quickly and that was already affecting the slopes. The lower elevations and areas exposed to the sun were feeling it first, and I wasn’t sure how much time I’d have left with good snow, so I quickly hopped on the Vista Quad for another trip. Up at the Vista Summit, I ran into Quinn and some of his fellow patrollers outside the patrol house. We chatted about the conditions, and how this weekend might be the last one for Timberline – very spring-like temperatures in the 40s and 50s F are on the way, and with the base at those lower elevations not overly deep, the coverage will be challenged. Leaving the patrollers, I headed over to check out the Villager Trees and see how the powder was hanging on with the rising temperatures. I got a few good turns in there, but the window of opportunity for good powder was just about closed, and I encountered a lot of thick snow. Although the off piste conditions were deteriorating, there was also a plus side to the temperatures edging their way above freezing – the on piste conditions were actually improving with the warmth and the groomed snow was something that you could really bite into. 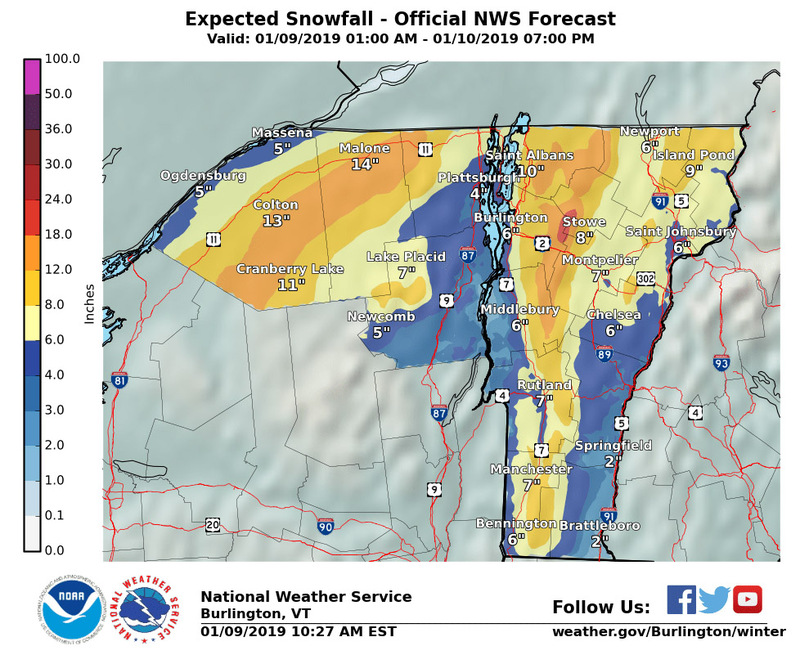 It hadn’t progressed to corn or anything like that, but it got me excited about spring skiing; I’m still more interested in the upcoming powder possibilities on Friday/Saturday with the front coming through though. That was my final run for the day, but when I reached Burlington I found beautiful weather with temperatures in the 50s F. It’s really nice to have this warm spring weather in the valley, but hopefully it won’t come on too fast because we’d like the quality snow to stick around for a while on the slopes. 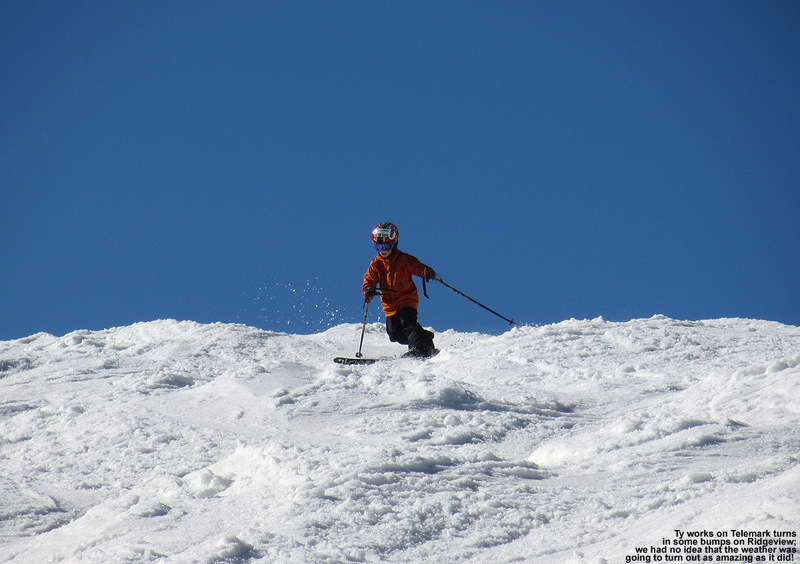 The local mountains have received multiple feet of snow over the past week or so, and the ski conditions have been mid-winter fantastic, but the continuous stretch of perfect snow looked like it might end in some areas yesterday as temperatures began to edge above freezing. I was at Bolton Valley yesterday, and we had a great morning of powder and packed powder conditions, but when the sun came out in the afternoon, temperatures shot up above freezing, and the powder began to get mushy. Temperatures dropped back down last night, which meant that any snow softening eventually stopped, but the question remained as to just how high the freezing levels had gone. There had been some concerns about rain overnight, but none of that seemed to materialize. We even had a touch of graupel/snow down at the house to sweeten up the surface of the snowpack, but what we really wanted to find out was what had gone on at Stowe, because that was our destination for today. Had it warmed up enough yesterday to affect the snow surfaces, and how much new snow had fallen on the mountain after that point? More snow was actually in the forecast for today, and that potential was encouraging, as it offered the chance to freshen up any surfaces that had deteriorated with the temperature changes. There were plenty of possible outcomes for today’s ski surfaces, but our questions wouldn’t really be answered until we actually got on the snow in the afternoon. 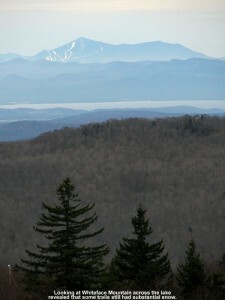 Fortunately, the snow that was in the forecast had already materialized, and Mt. Mansfield was busy catching its share. When we finally headed off to Stowe in the late morning, we found that snow was falling lightly in the mountain valleys to the east of the Greens. Meanwhile, off to the west, the mountains themselves were hidden behind a veil of more intense snowfall. As we approached Mt. Mansfield the snowfall grew steadier and heavier, and while it would still be considered light in intensity, it was accumulating even at the base elevations (~1,500’) when we arrived at the resort. As is often the case, the snowfall was heaviest over by The Chin, so we knew that there would be some decent accumulations up there. It was pretty much the usual Sunday routine at the resort today, although the number of visitors was definitely on the low side. We had our standard coaching group, with me, Ty, Dylan, Luke and Jack. Claire was likely to be with us as well, but she had to make sure that all the groups were set for coaches, so the rest of us did a warm up run while she took care of coordinator duties. We made a trip up the Sunny Spruce Quad, and up top at around 2,500’ we found new snow accumulations of roughly two inches. The warming from yesterday had indeed hit Spruce Peak up to that elevation though, as there was a melt/sun crust below the new snow that made the off piste skiing not nearly as blissful as what it had been last week. With that said, it wasn’t a massive warm up, so our forays into the trees in the Side Street area revealed some decent turns, but you really had to be on your game due to the variability of the subsurface. While not fantastic, the off piste conditions on the lower slopes of Spruce were encouraging enough to make me suspect that with both higher elevations and a much better aspect, the snow on Mt. Mansfield could be really good. So, as soon as Claire found out that all the program groups were set, we met up and were immediately on the Over Easy to the big mountain. Last Sunday we’d brought the boys to the Chin Clip Streambed for the first time, and this new playground was met with resounding enthusiasm. To continue the trend of terrain introductions, I decided that it was time to get them out to the Kitchen Wall. Today was the perfect opportunity to do it as well, since if anywhere on the mountain had preserved winter snow, the Kitchen Wall would do it. As a test of snow conditions, for our first run we cut in below the Kitchen Wall traverse – I didn’t quite want to bring them all the way out on the full traverse if we were going to be dealing with some sort of nasty crust. There was no cause for concern though, the cooling power of Mt. 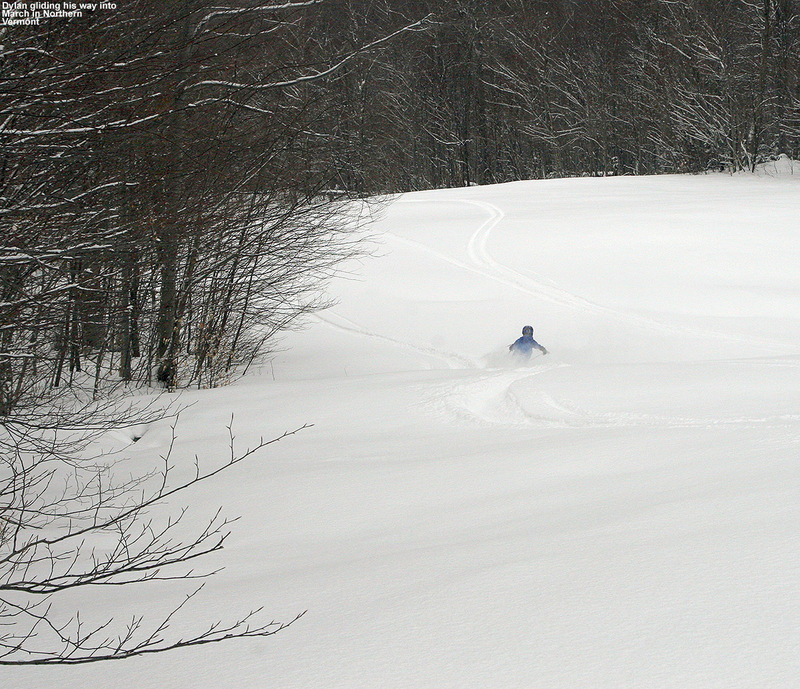 Mansfield had been in full effect yesterday; thus there were no signs of crust and the powder was fantastic. We skied through the catacombs of trees that brought us back to Cliff Trail, and the snow was simply amazing, mid winter powder down to the 3,000’ elevation. We caught Rim Rock over to Switchback, and while not quite as stellar as it had been above the 3,000’ mark, the snow still stayed decent all the way down to ~2,500’. Below that elevation you could manage some OK turns off piste, but the returns on your effort were minimal, so on piste was the way to go. 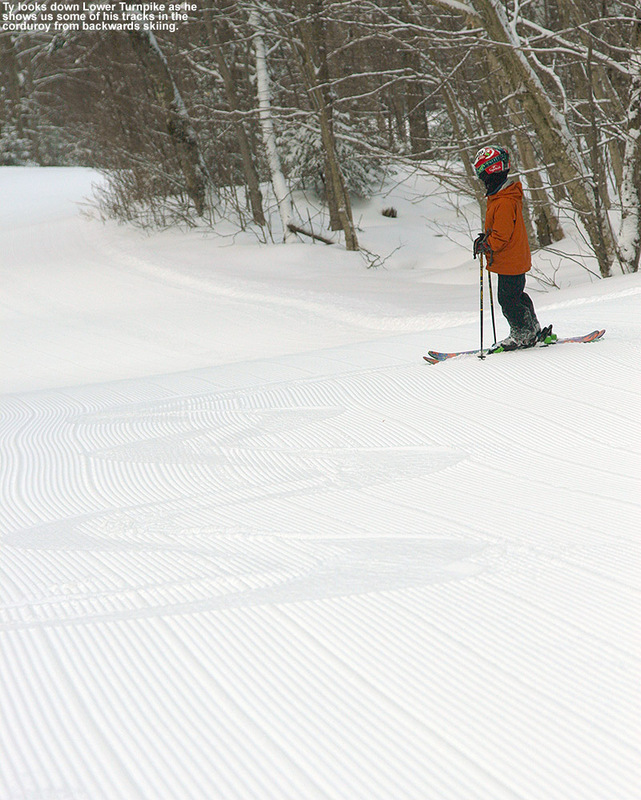 Grooming and/or skier traffic took care of any subsurface issues, so turns were beautiful if you stayed on piste. Still, a half run with off piste options topped off with another 1,000’ of groomers made for quite a nice descent, so we immediately hit the gondola for another round. This time, I brought Claire and the boys on the full Kitchen Wall traverse, and the ups and downs on the unknown route into what seemed like wilderness, brought plenty of excitement to the boys’ faces. 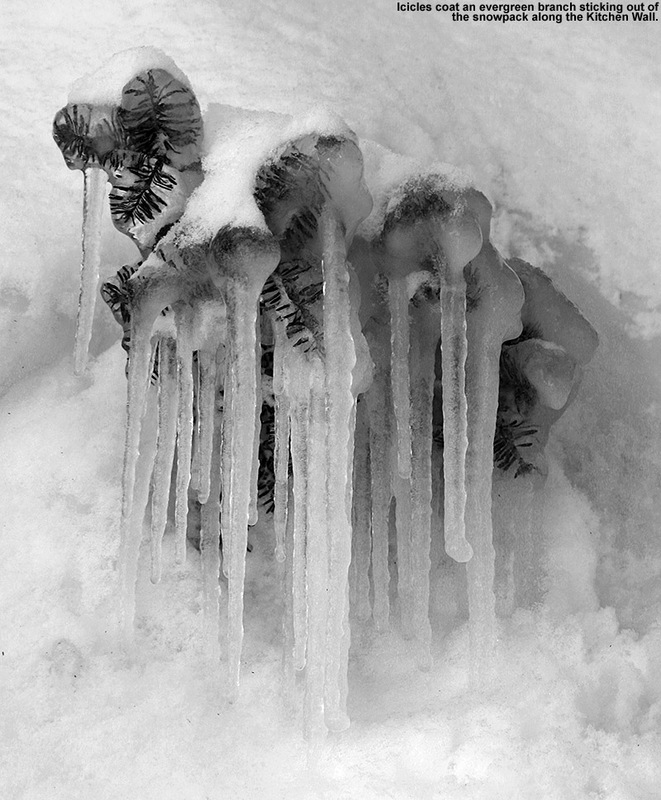 As usual, we encountered lots of cool snow formations that had been brought about by almost a season’s worth of leeward snow accumulations from winter storms. 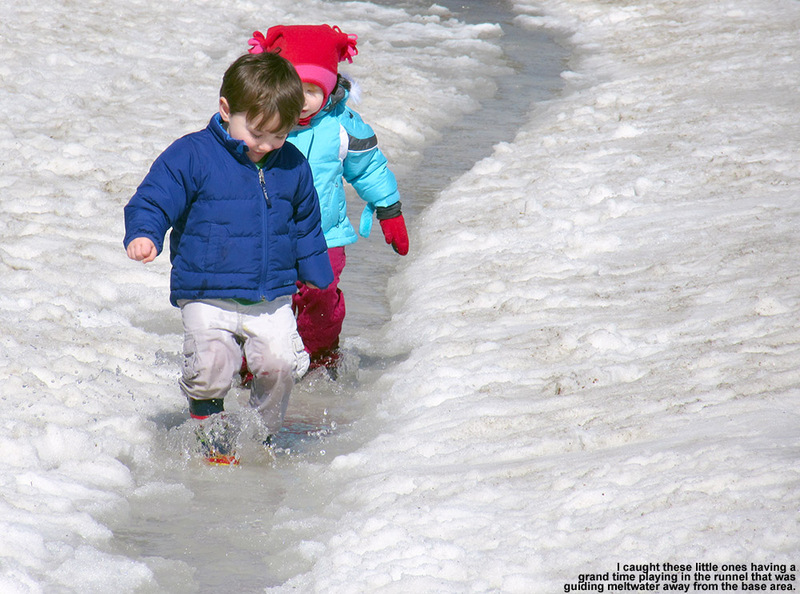 When I felt that we’d traversed far enough, we stopped atop one of the snowfields, and let the boys play around in the snow and soak in the atmosphere. They had a great time, climbing on the rocks, poking their noses into caves, playing in the steep and deep faces of snow, and just being boys in winter. The snow quality was fantastic up there, and with layer after layer from the recent storms, it was indeed starting to get deep. Writing this report up now, as I look at the notes I made myself about the Kitchen Wall I see the words “bottomless, bottomless, bottomless”. I’d say that sums it up right there. Dropping steep turns through one of the Kitchen Wall snowfields was certainly a primo experience, but all down through the trees below, the snow was excellent. We eventually made our way along Cliff Trail, over to Nosedive, and then worked into the Goatdive woods to see just how low we could go with good snow off piste. We hung in there for a while before eventually merging back on piste at Goat, where the bumps were in mid winter form. When one starts a run at the Kitchen Wall, it can seem like the run goes on forever, and this was one of those. 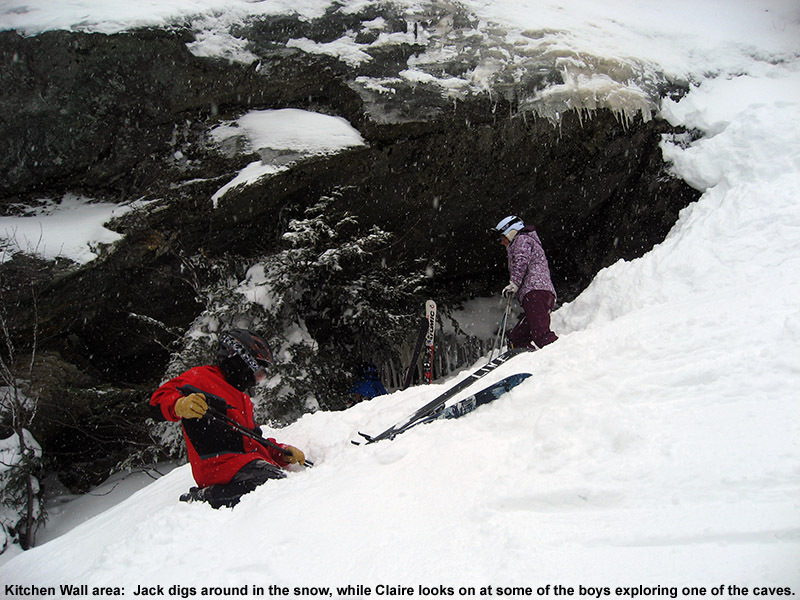 When we finally reached the base of the Fourrunner Quad, it felt like ages had gone by since the boys were floundering around in the deep powder way up below the Mansfield ridgeline. 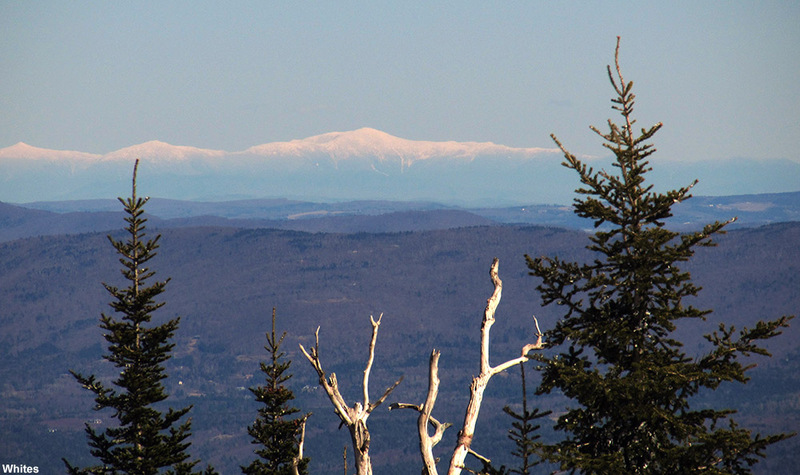 Powderfreak recently posted a picture from a run on Stowe’s Lookout trail in the New England Regional Forum at American Weather, and it got me thinking about what a great trail it is, so I brought it up as a descent option and the boys were game. I’m not sure how long it’s been since we’ve taken a run down Lookout, but I’m continually impressed with just how steep and long it is. We got treated to some great snow surfaces, and the sight of big beautiful flakes falling from the sky as Mother Nature continued to beef up the cushioning of the surfaces for us. The boys still hadn’t had enough after that run though, so from back at the Gondola we skied the Tombo Waterfall down to Perry Merrill. 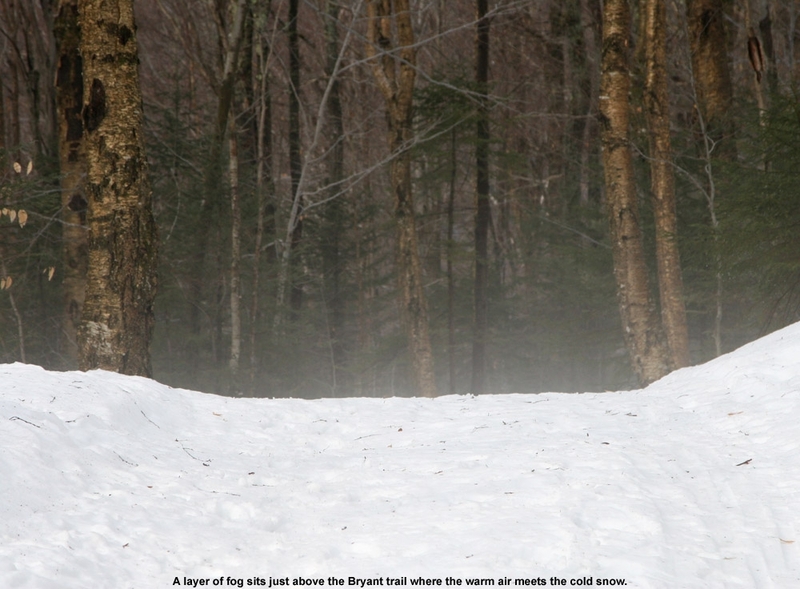 Ty led an amazing charge down Perry Merrill, with relentless slalom turns along the skier’s right of the trail. It was all I could do to keep up with his pace, and anyone that hung with us got quite a workout. If I’d been on my Telemark skis there was no way I would have been able to keep that pace for that long, so thank heavens for alpines. So although there was some 32+ warming below the 2,500’ level on Mt. 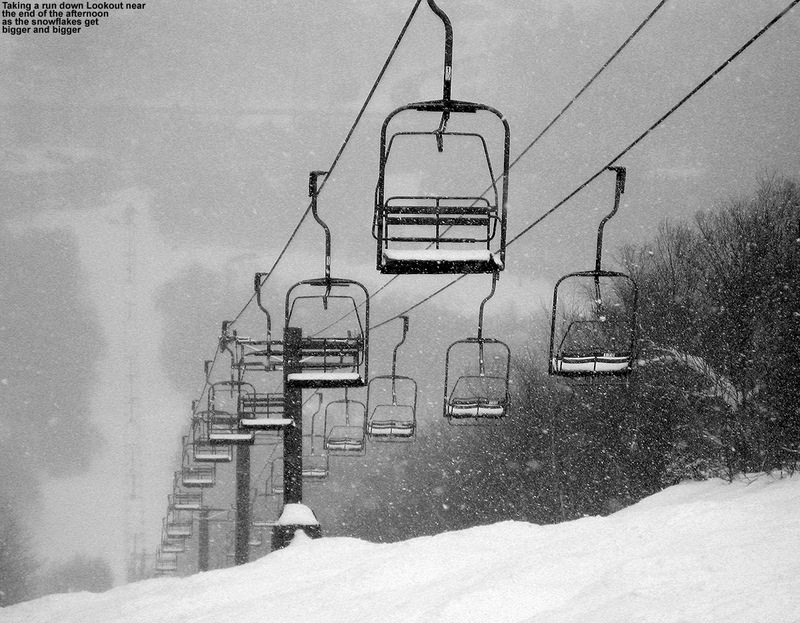 Mansfield yesterday, the conditions really were quite impressive over much of the mountain today. Although not intense, it snowed all afternoon, and that really helped to keep improving those surfaces that needed it. There had to be a few inches of new accumulation up above 3,000’, and since it doesn’t seem like those areas ever went above freezing anyway, they’re just going to be getting better. 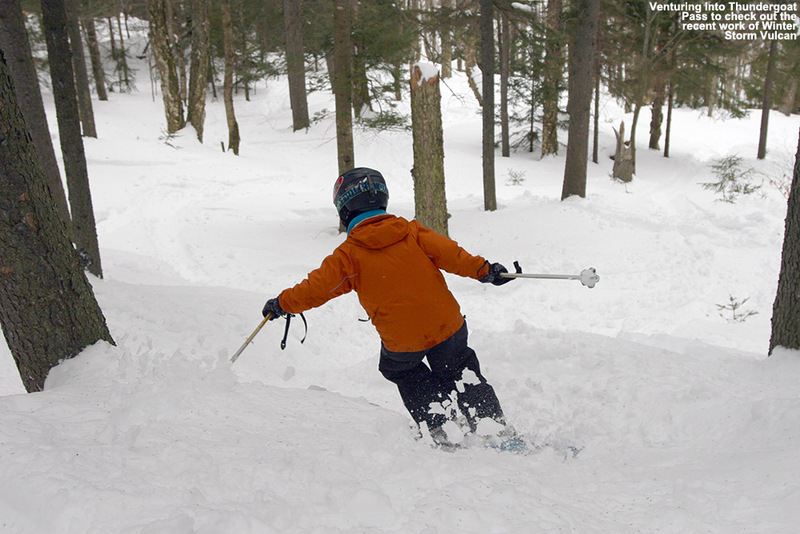 Basically everything on the upper half of the mountain was very much like it’s been all week, deep and soft like you’d expect to find in Northern Vermont in March. Some of the heaviest snowfall we saw today was actually when we were leaving, and it was still snowing in the valleys most of the way home. The snow gradually dropped off in intensity as we headed toward Stowe Village, and was fairly minimal through Waterbury Center and Colbyville, but as we headed down the hill from Colbyville into Waterbury, it began to pick up and I suspected it was even more intense at the house. We looked down the Winooski Valley and saw that indeed there was an impressive wall of white in that direction. By this evening, we’d picked up another couple of inches of snow at the house, which should translate into at least that much in the mountains. 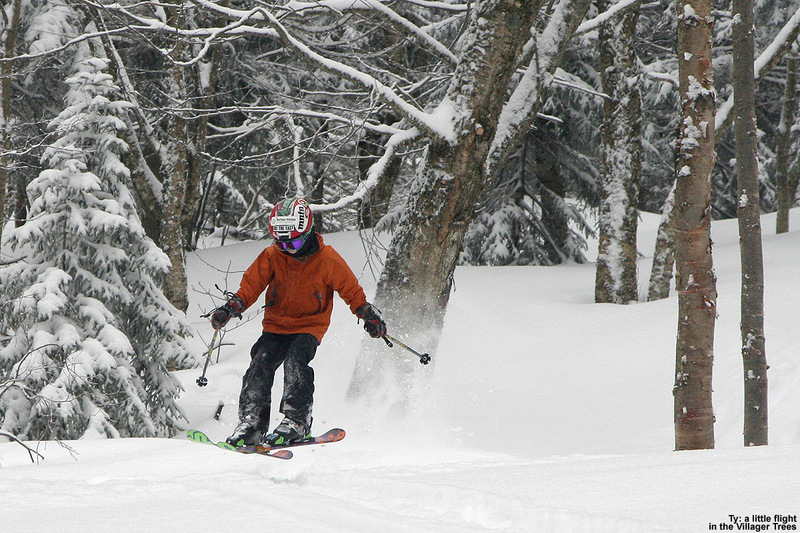 Conditions are very good, so get out and get those turns.